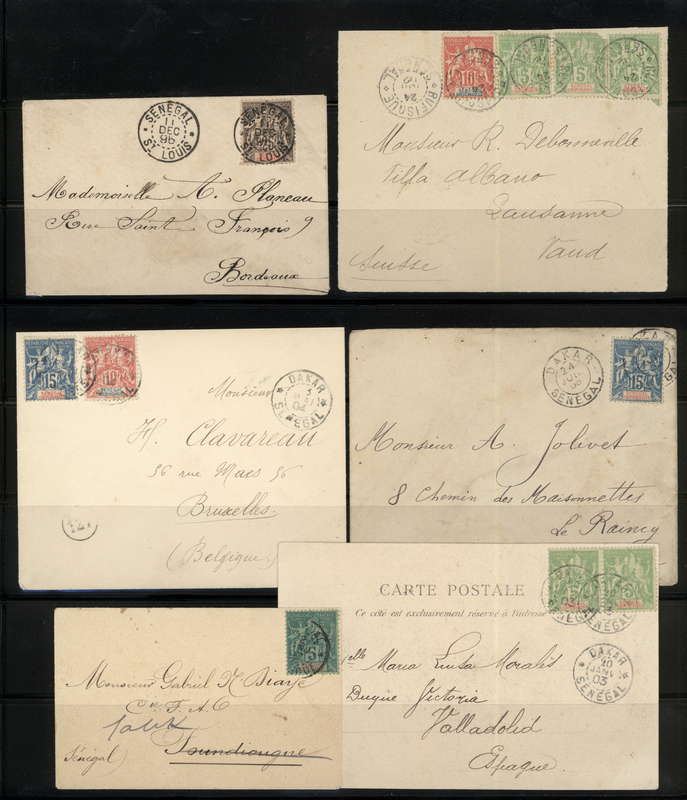 31498 postfrisch (never hinged) ** 1964/1972, accumulation in a big box with many complete sets incl. 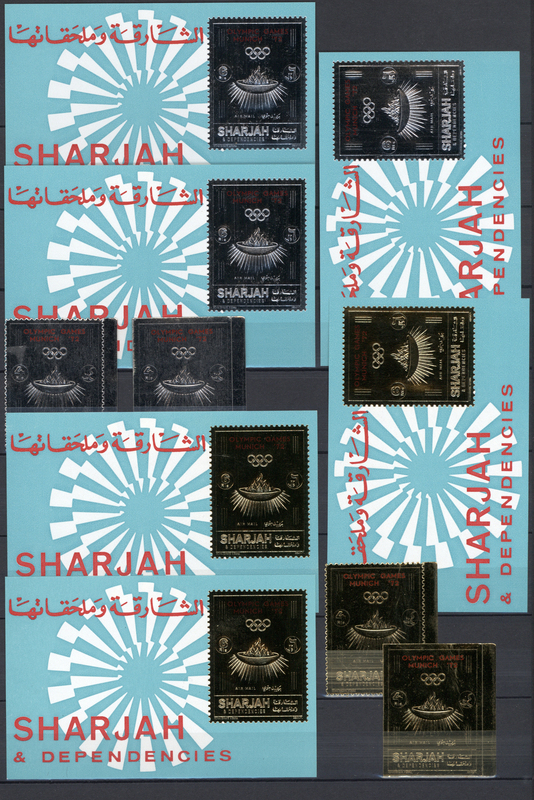 heavy duplicated sheetlets with many topics like paintings, space, animals, Olympic Games etc., unperforated issues and metal foil stamps. 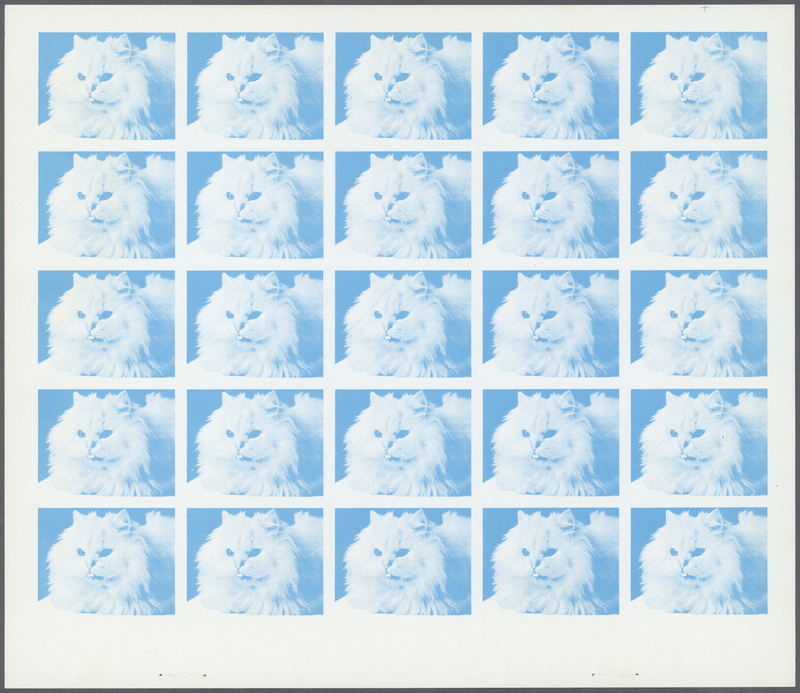 Mint never hinged, some with stainspots, and a high cat. value. 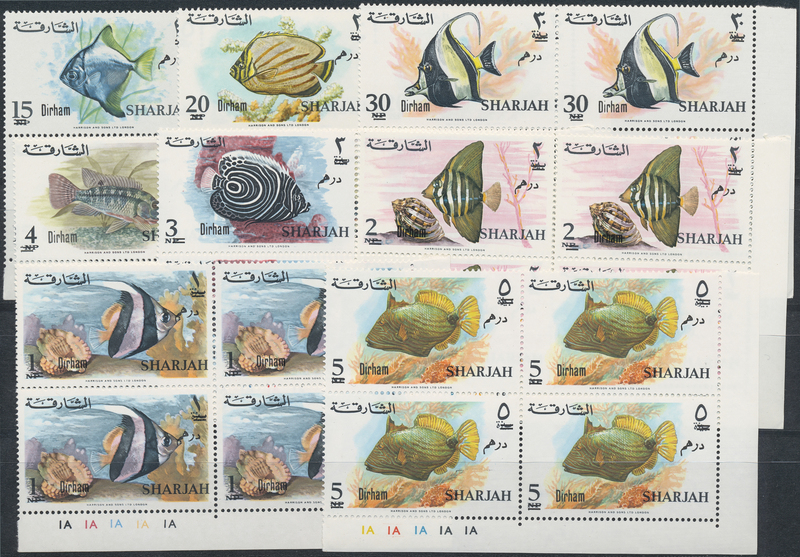 31502 postfrisch (never hinged) ** 1966, Fish, investment lot of at least 50 sets mint never hinged, probably more, also some issues of Khor Fakkan. Mi.No. 316/332, cat. val. much more than 3500,- €. 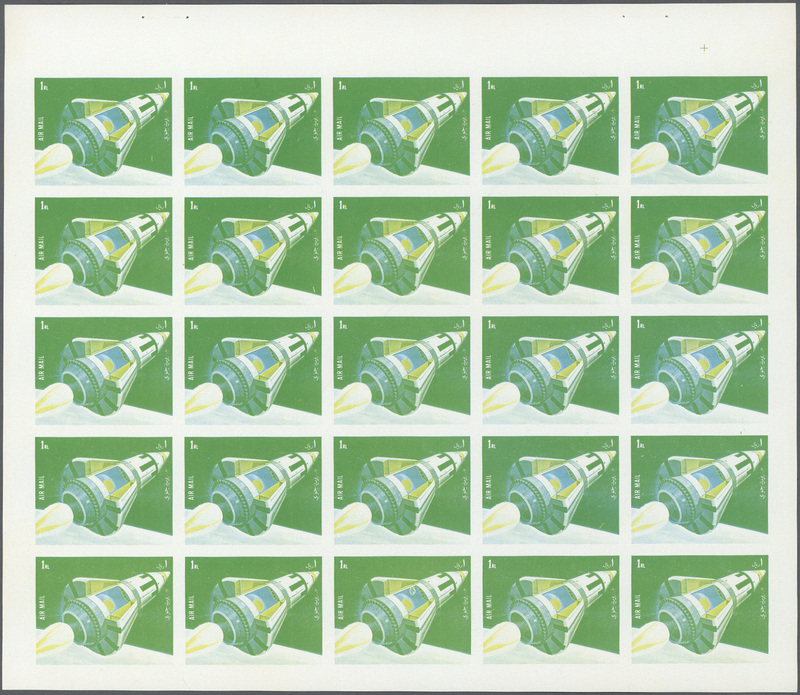 31504 postfrisch (never hinged) ** 1966/1972 (ca. 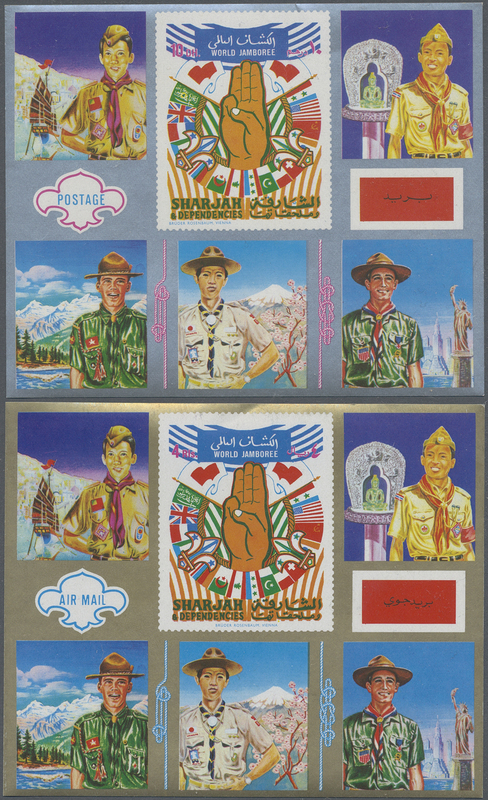 ), mint never hinged accumulation in a box with many souvenir sheets, little sheets and sets in parts of sheets. 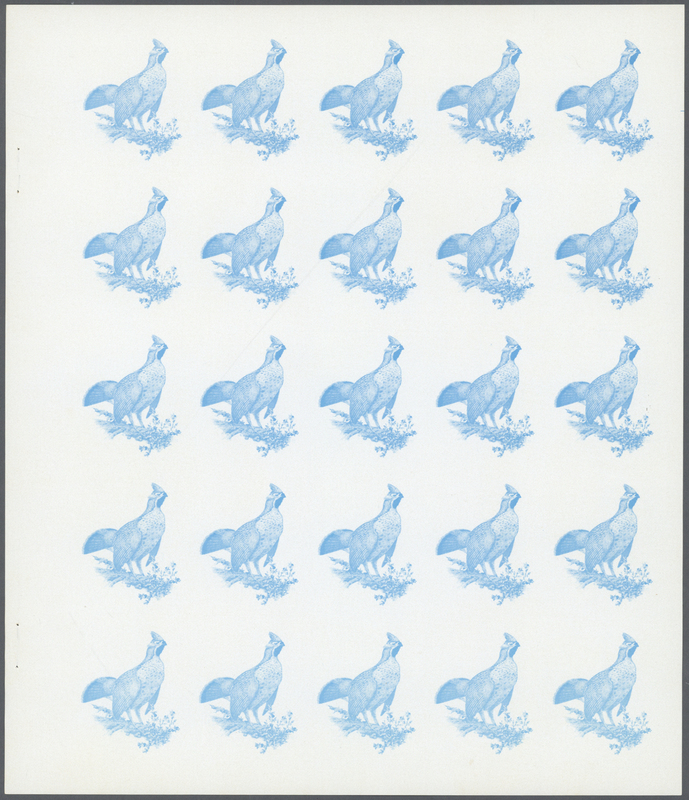 Also covers many thematics like art, scouts, football, animals etc. High catalogue value. 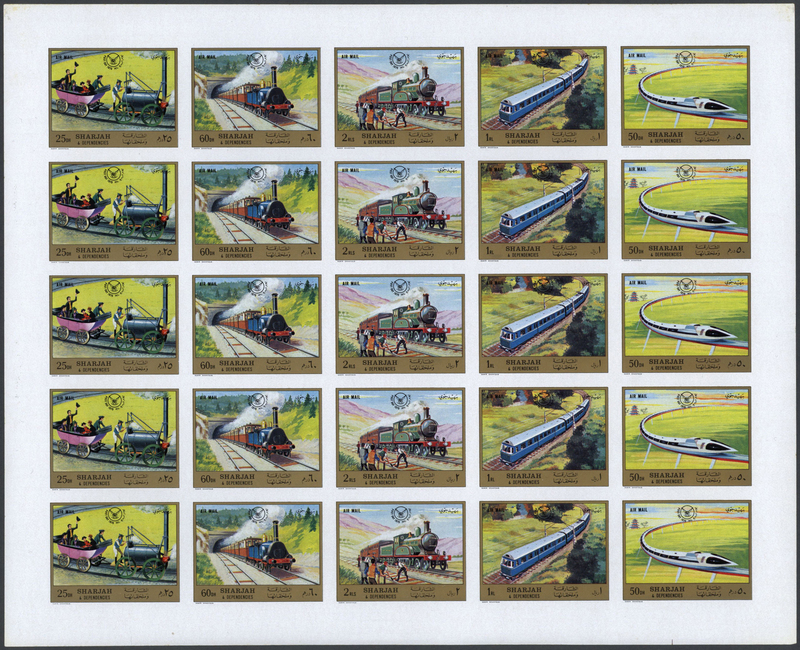 31505 postfrisch (never hinged) ** 1966/1972, u/m collection of complete sheets, mainly complete sets, incl. 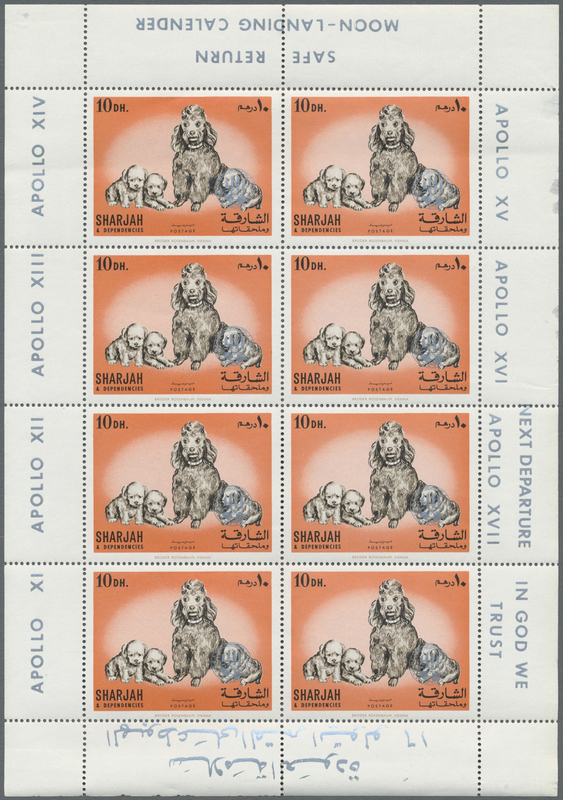 attractive thematic issues like "Space" and "Animals". Michel cat.value 2.120,- €. 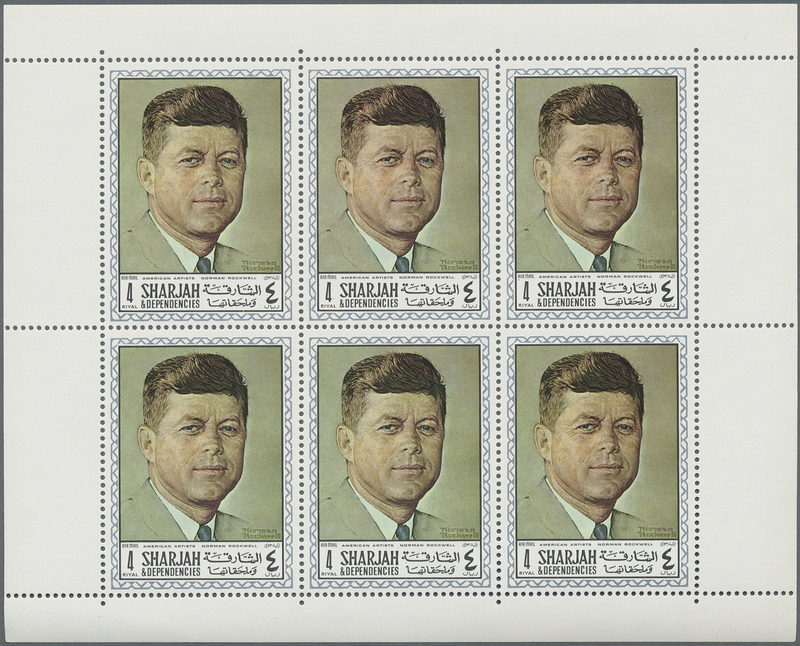 31506 postfrisch (never hinged) ** 1968, American paintings, 480 sets of this issue perfor. and 35 sets imperf. 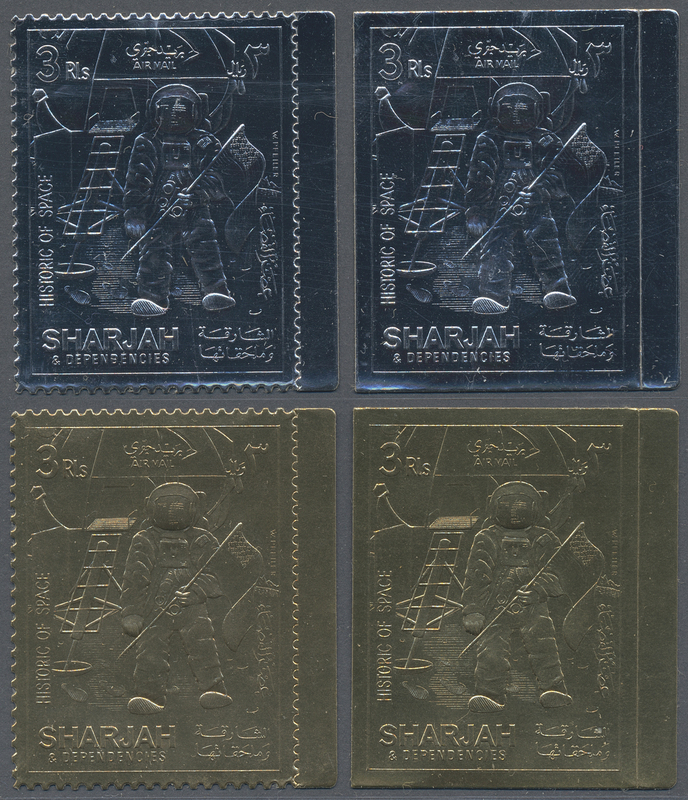 in little sheets of 6 stamps each, mint never hinged. Mi.no. 448/455 A/B, cat. val. 3580,- €. 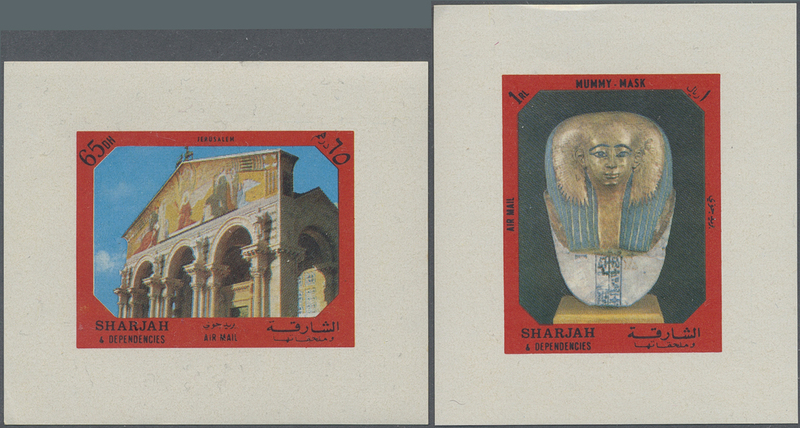 31507 postfrisch (never hinged) ** 1968, Ancient Egyptian Art, u/m accumulation of imperf. 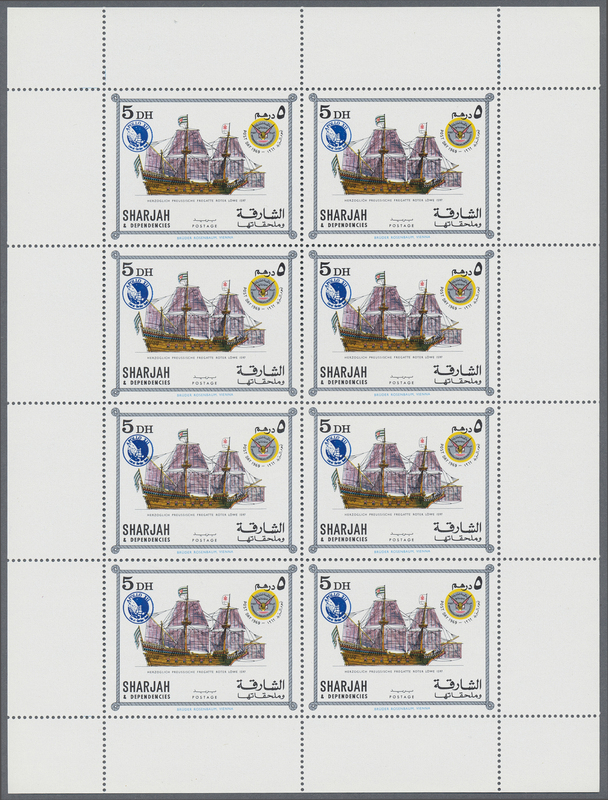 sheets (eight stamps each): 15dh. 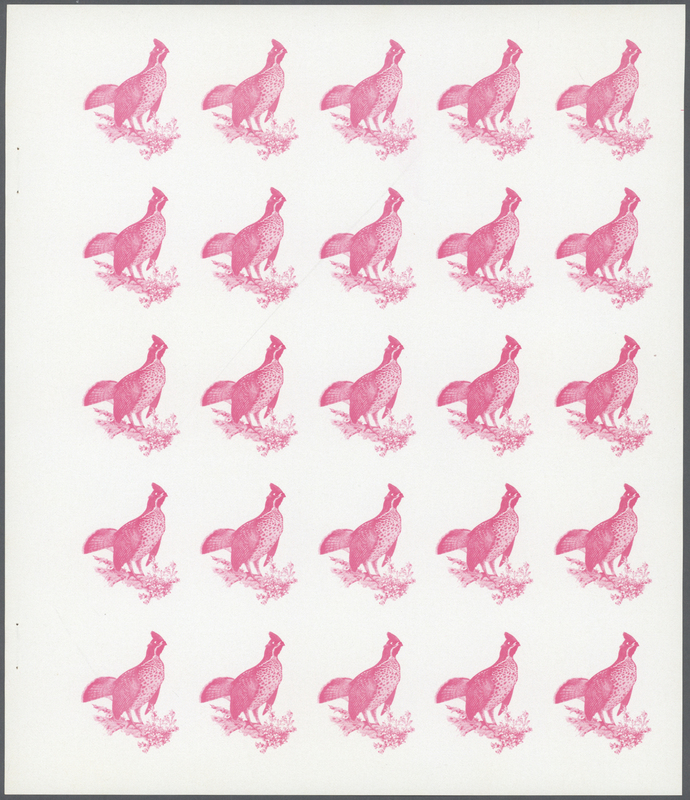 (63 sheets), 25dh. 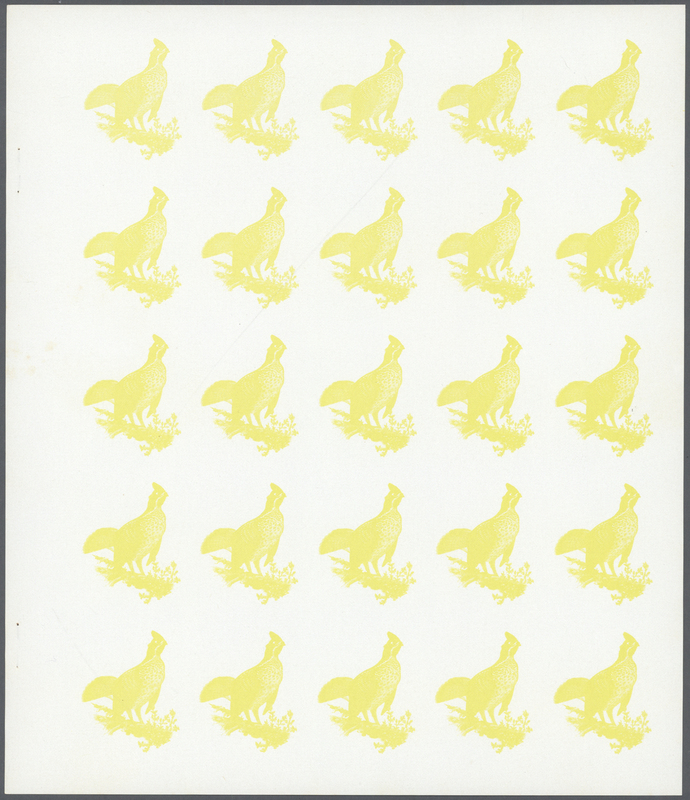 (three sheets), 35dh. 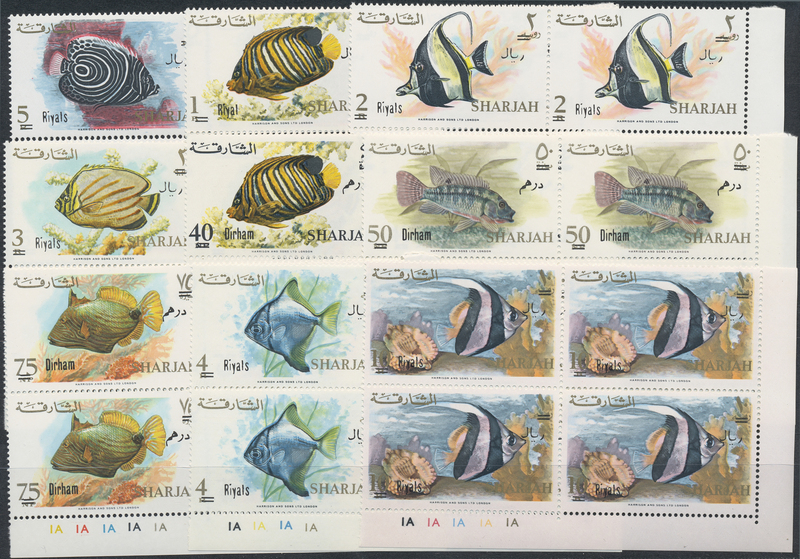 (63 sheets), 45dh. 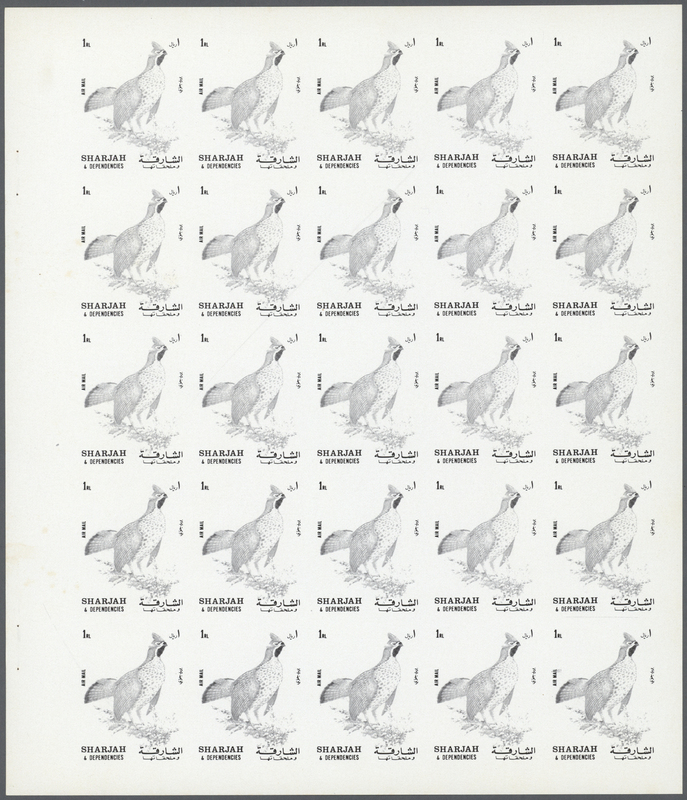 (43 sheets), 55dh. 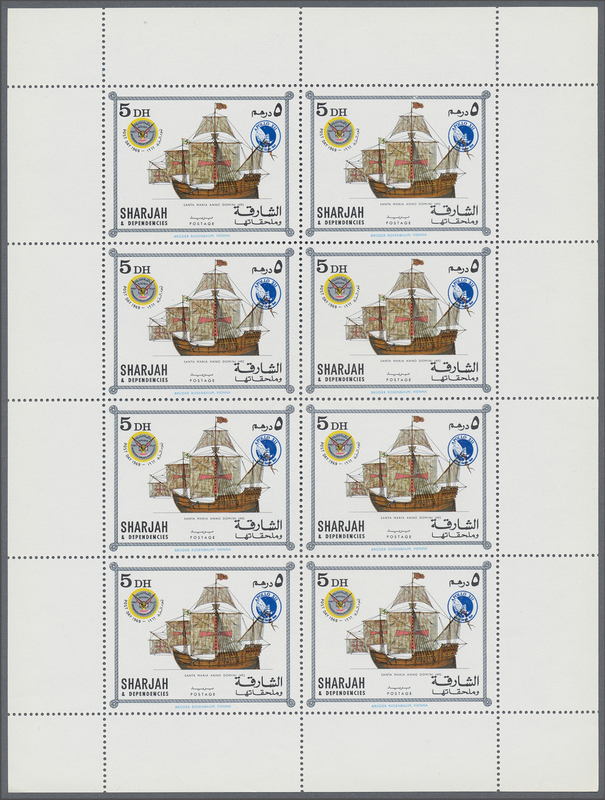 (63 sheets), 65dh. 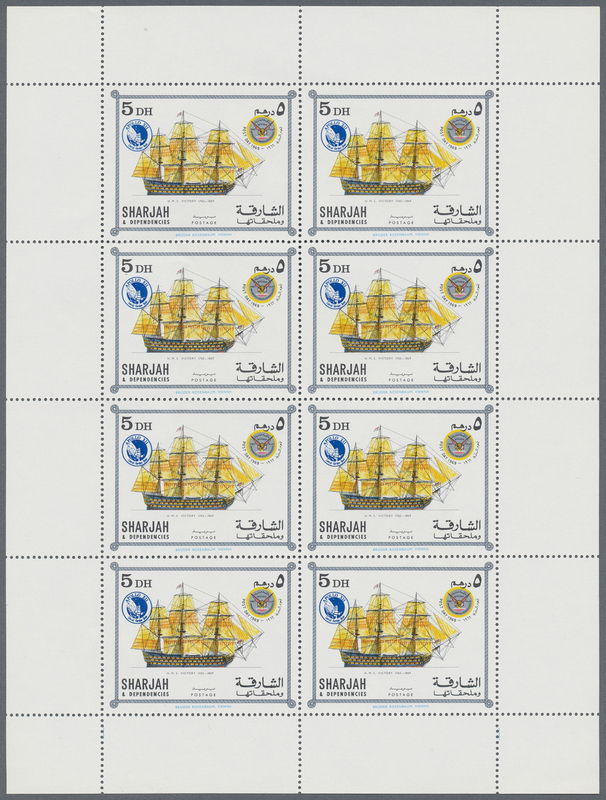 (63 sheets), 75dh. 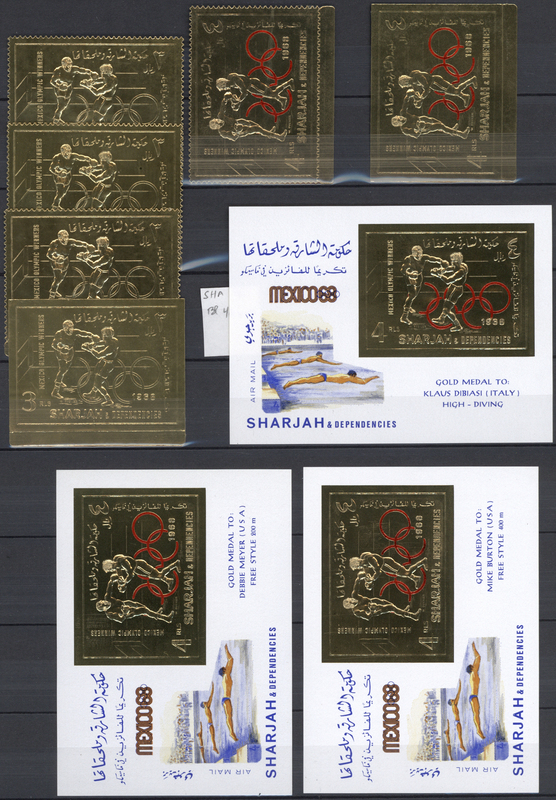 (63 sheets), 95dh. 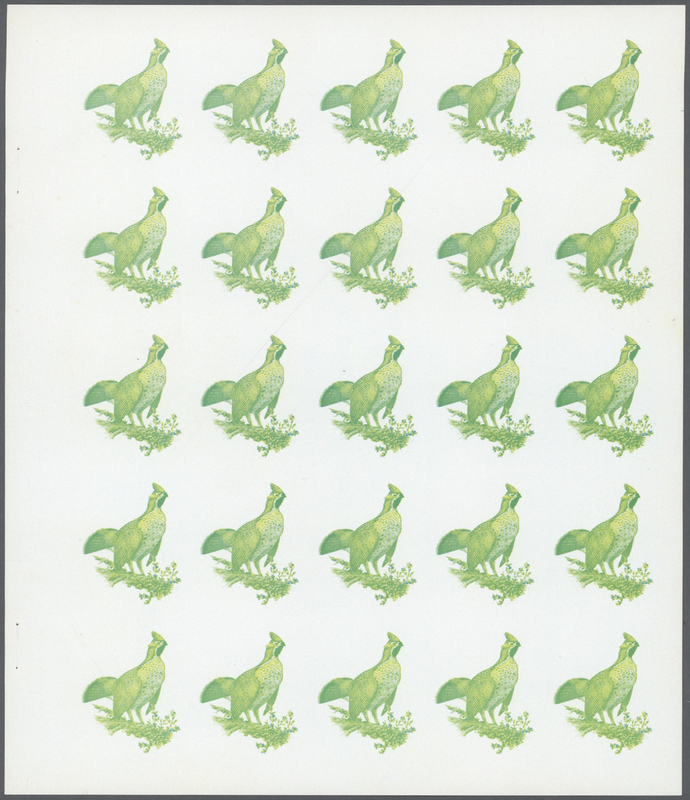 (63 sheets). Michel nos. 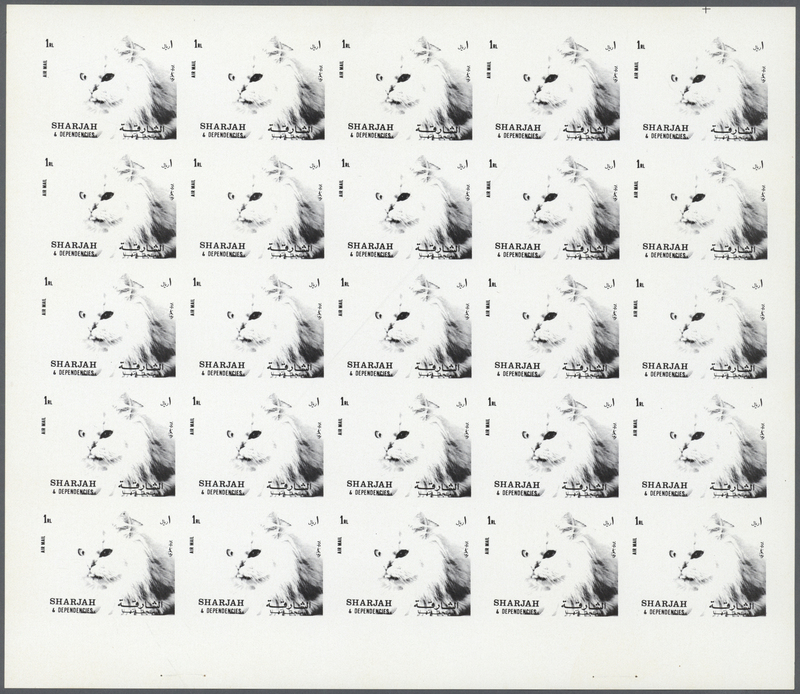 456/63 B, cat.value apprx. 8.300,- €. 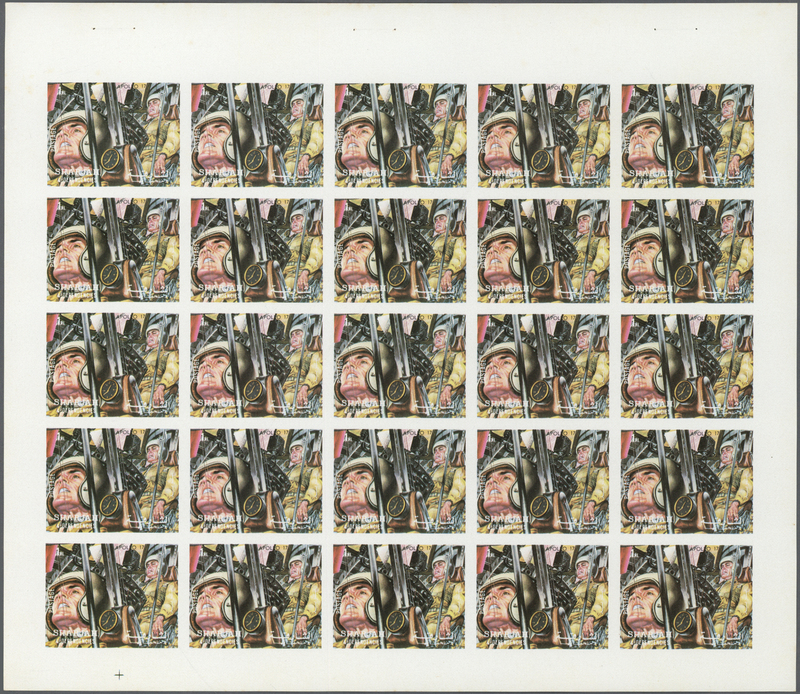 31508 postfrisch (never hinged) ** 1968/1972, incredibly huge stock mint never hinged, hundreds of stamps ex. Mi.no. 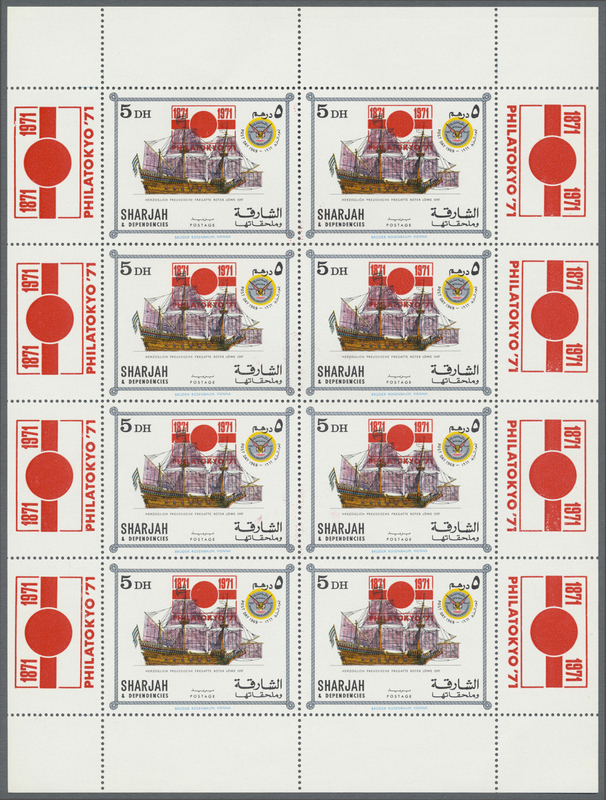 442/447 (definitives), 889/901 (Churchill, Kennedy), 903/936 (scouts), 1100/115 (Philatokyo), 1228/1237 (ancient art) and many more as well as thousands of copies of the blocks Mi.no. 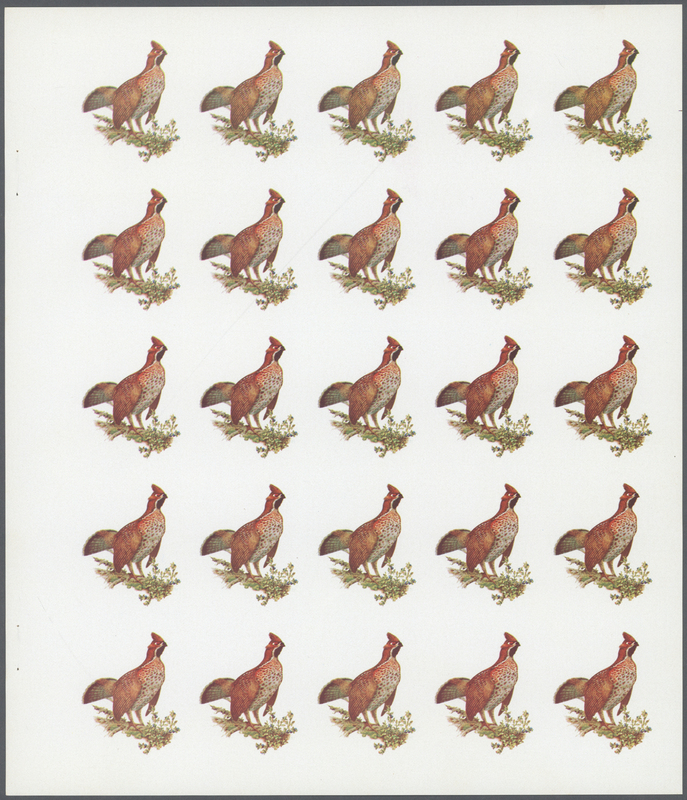 101/102 (scouts), 147 (animals), hundreds of no. 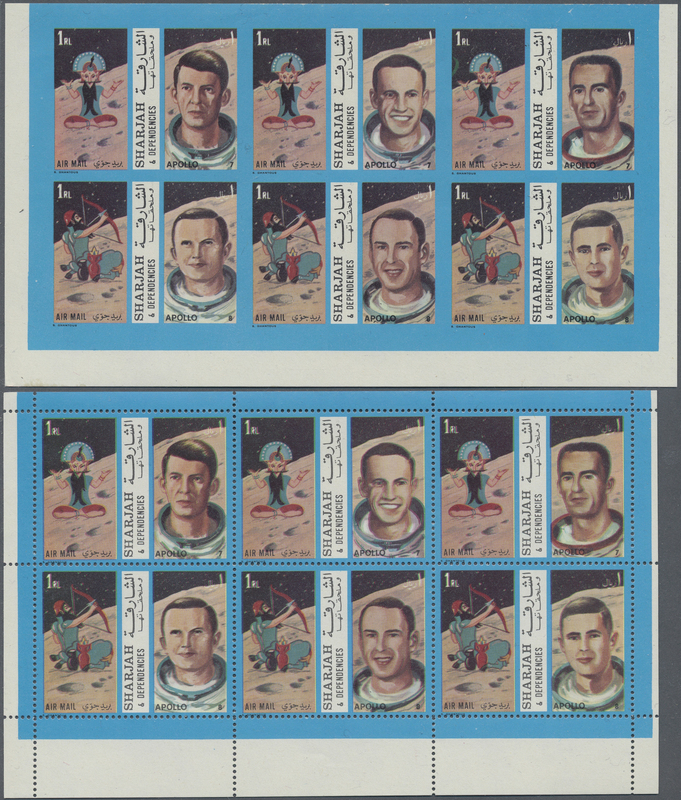 159a/b (overprint Apollo16). Sometimes stainspots. Huge cataloge value. 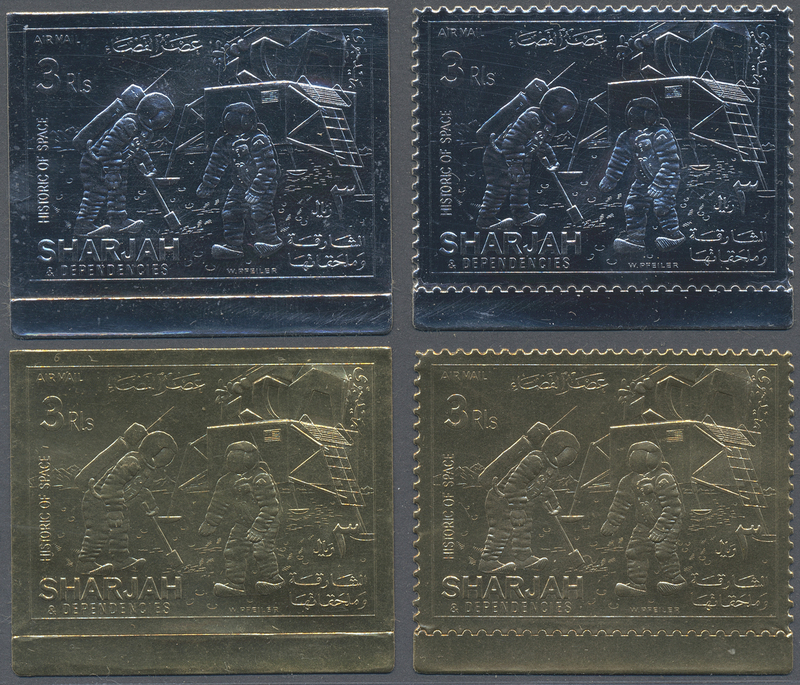 31511 postfrisch (never hinged) ** 1969/1972, GOLD and SILVER issues, u/m accumulation of apprx. 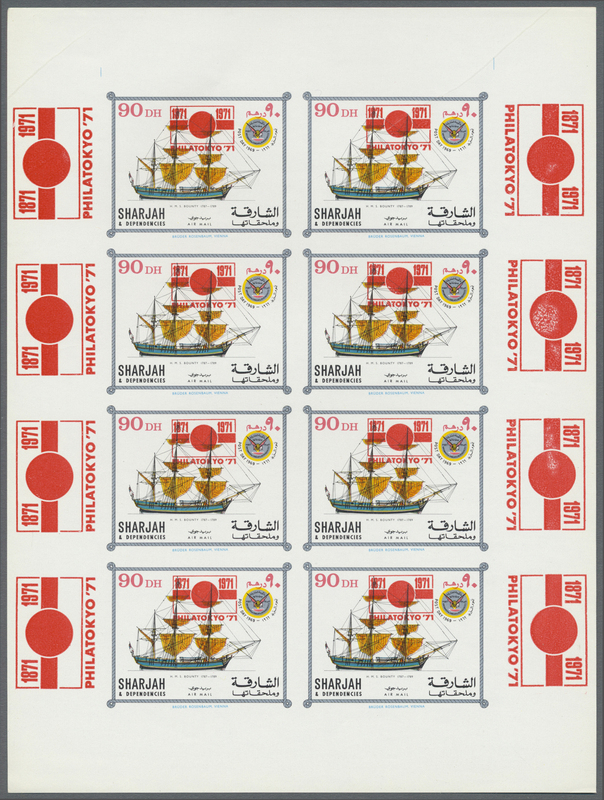 200 souvenir sheets and apprx. 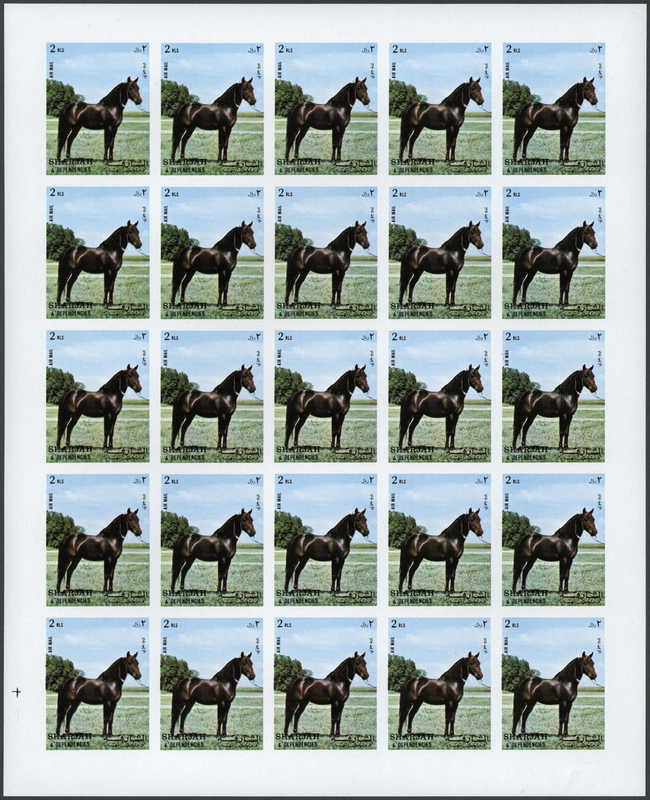 120 stamps. 31512 postfrisch (never hinged) ** 1970 (ca. 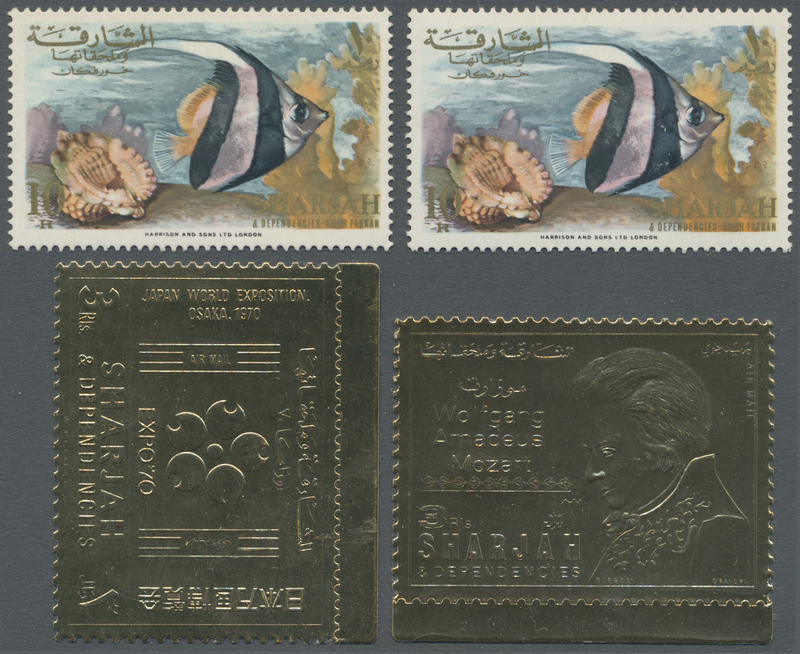 ), Prominent Persons 'CHARLES DE GAULLE' gold and silver foil stamps investment lot with about 550 stamps incl. silver perf. (180) and imperf. (240) and gold perf. (4 only) and imperf. 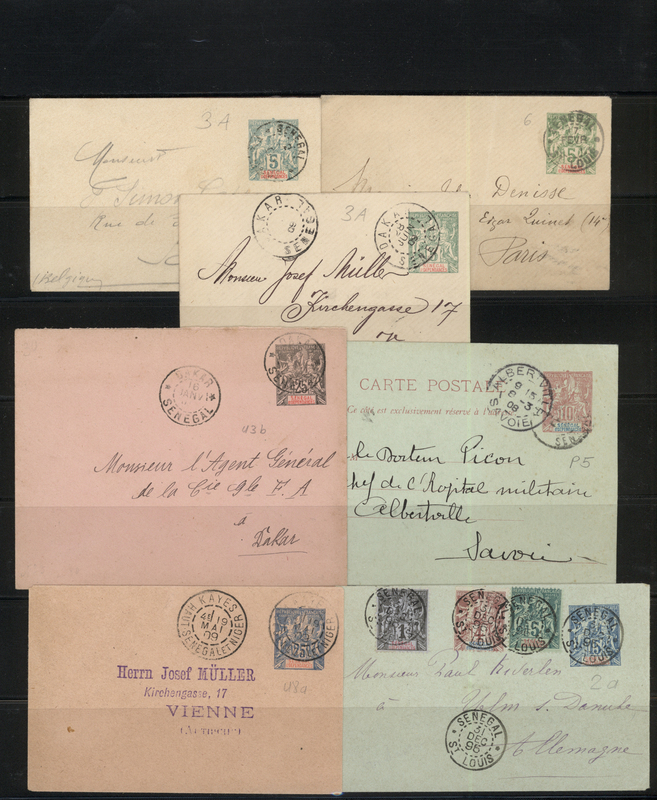 (130), mint never hinged, unusual and very scarce, UNLISTED in Michel cat.! 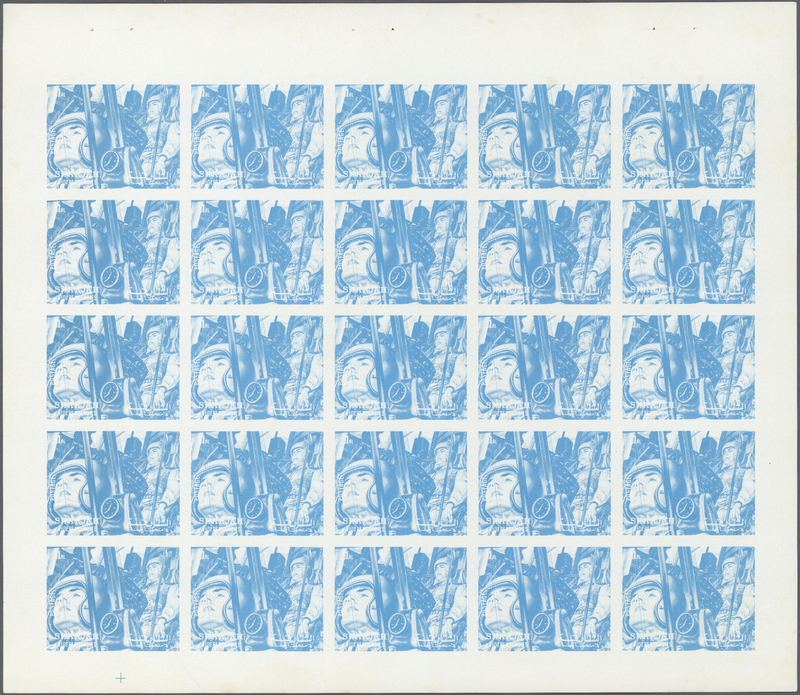 31513 postfrisch (never hinged) ** 1970 (ca. 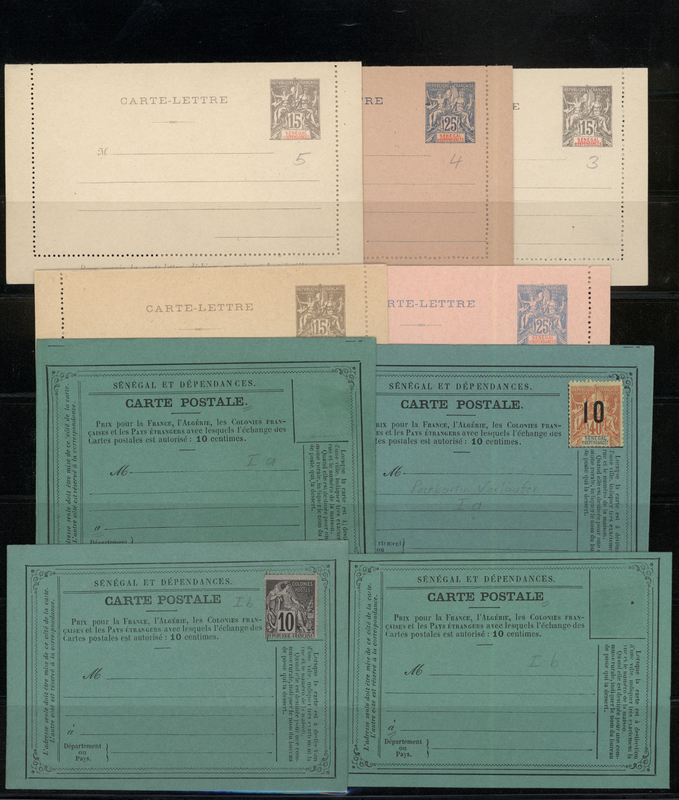 ), Prominent Persons 'DE GAULLE' gold and silver foil stamps investment lot with about 342 stamps incl. silver perf. (160) and imperf. (110) and gold perf. (2 only) and imperf. 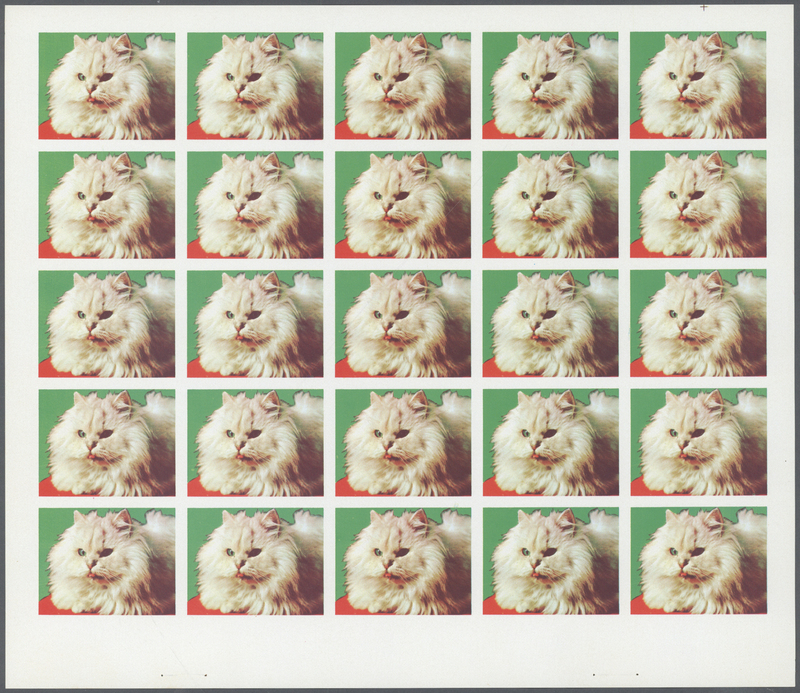 (70), mint never hinged, unusual and very scarce, UNLISTED in Michel cat.! 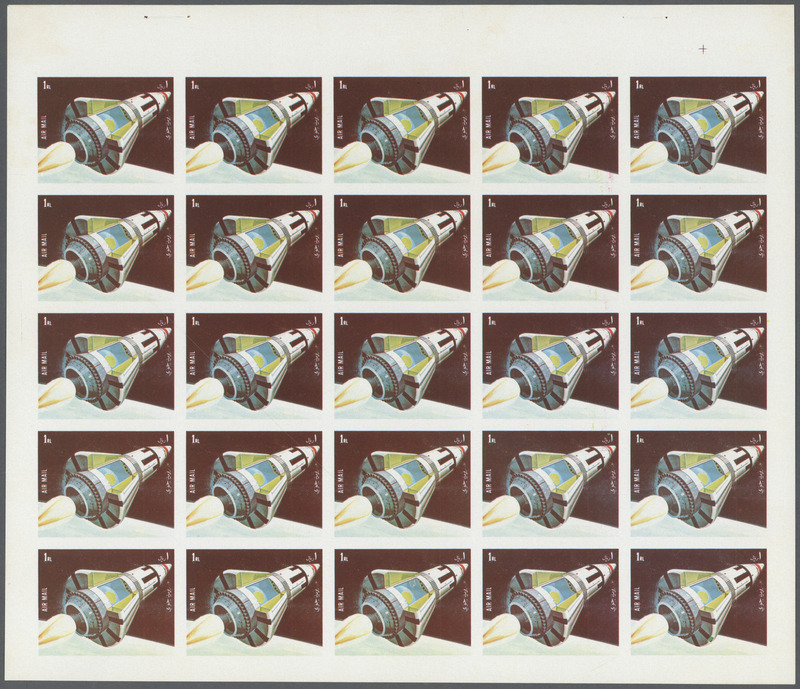 31514 postfrisch (never hinged) ** 1970 (ca. 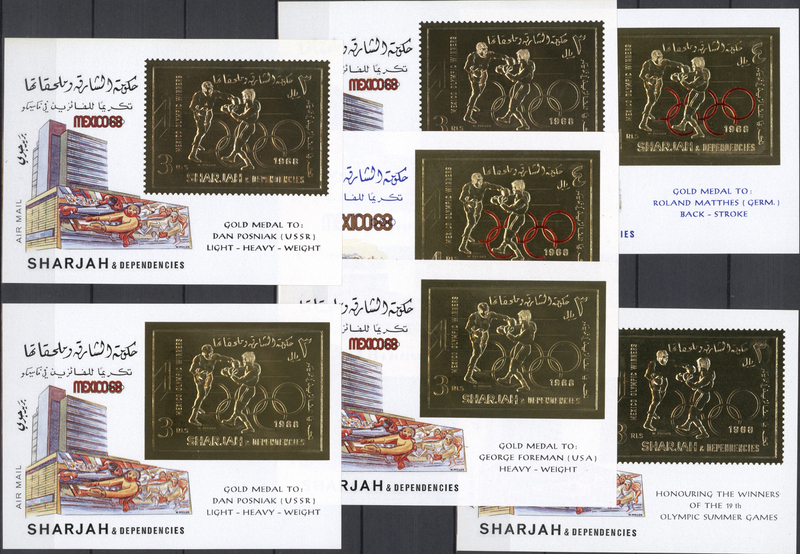 ), Prominent Persons 'In Memoriam President NASSER' gold foil stamps investment lot with about 150 stamps incl. perf. (50) and imperf. 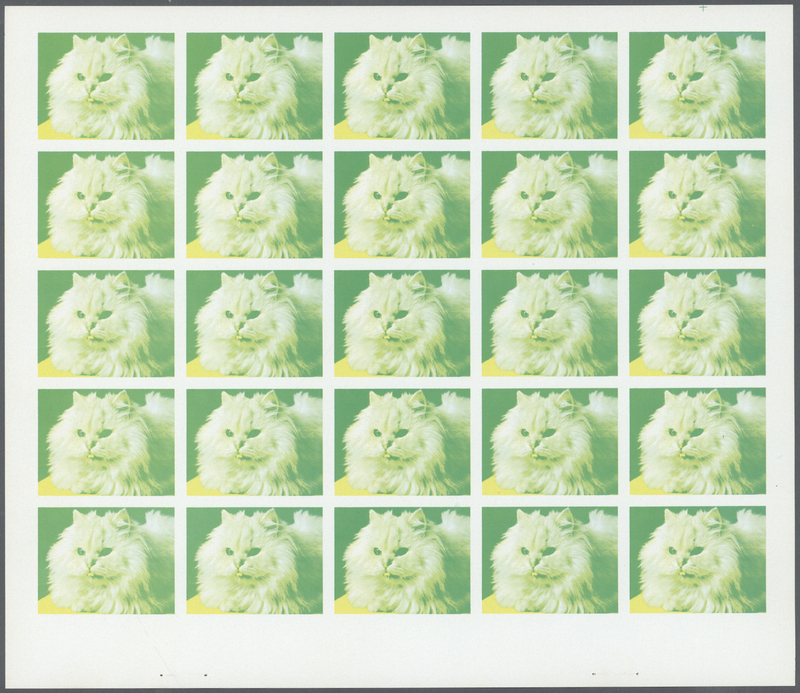 (100), mint never hinged, unusual and very scarce, UNLISTED in Michel cat.! 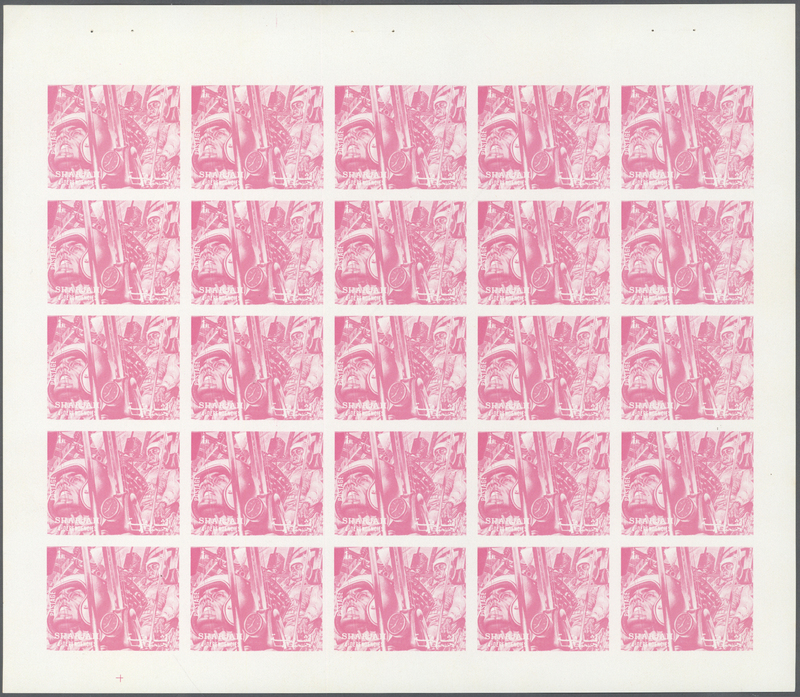 31515 postfrisch (never hinged) ** 1970 (ca. 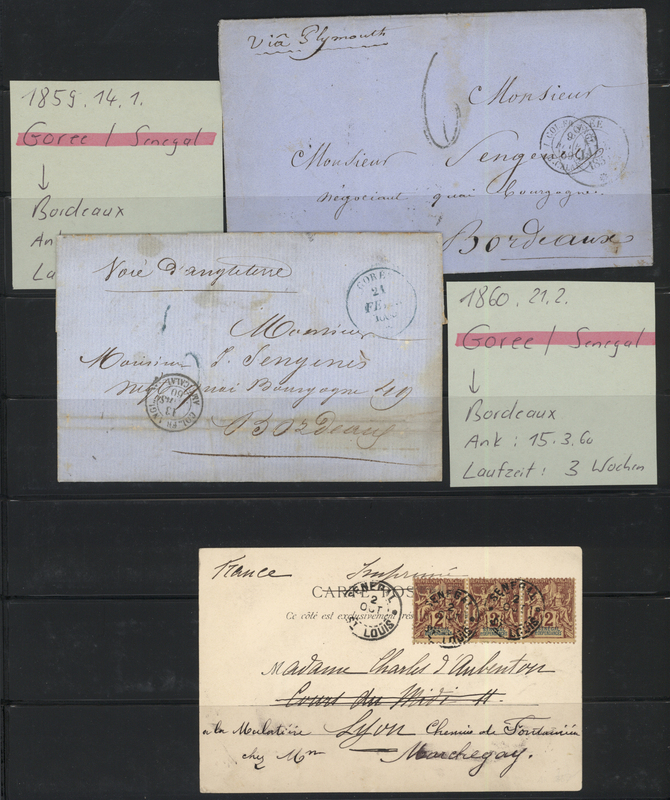 ), Prominent Persons 'J. 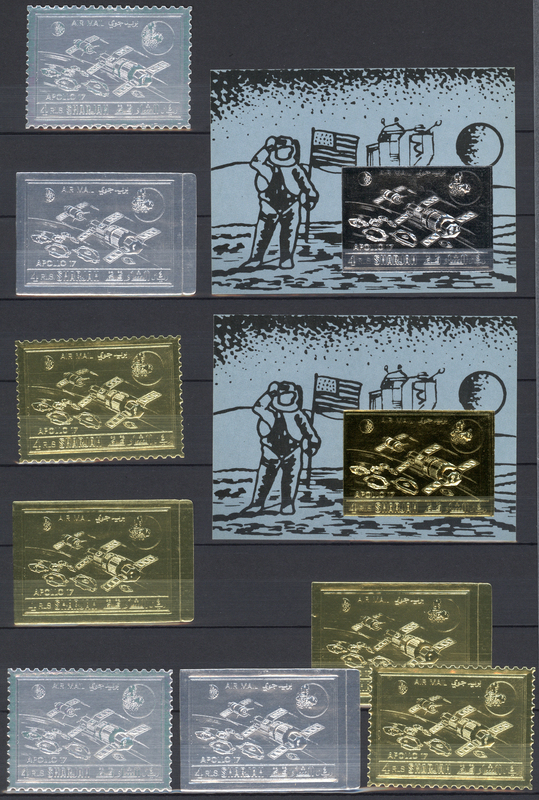 F. KENNEDY' gold and silver foil stamps investment lot with about 1.380 stamps incl. silver perf. (300) and imperf. (300) and gold perf. (480) and imperf. 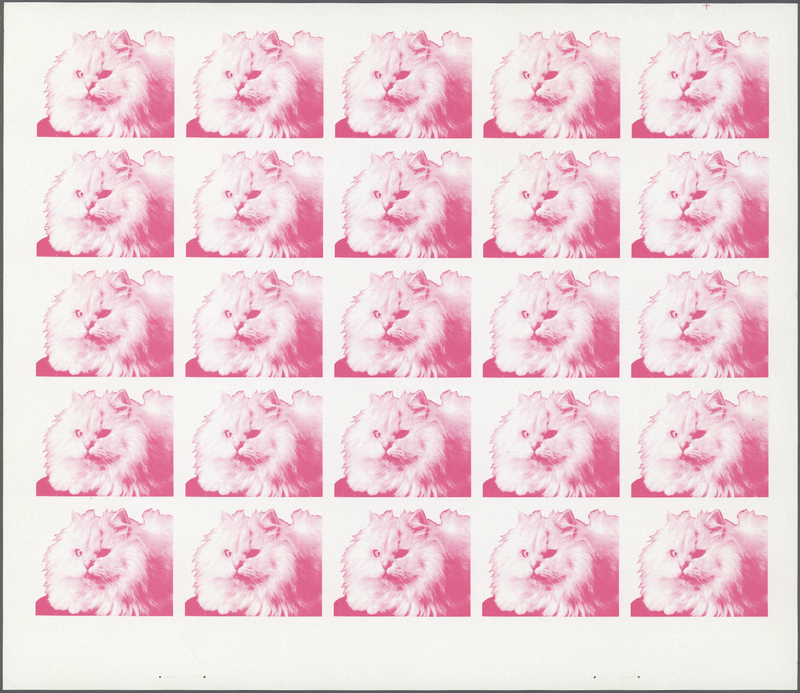 (300), mint never hinged, unusual and very scarce, UNLISTED in Michel cat.! 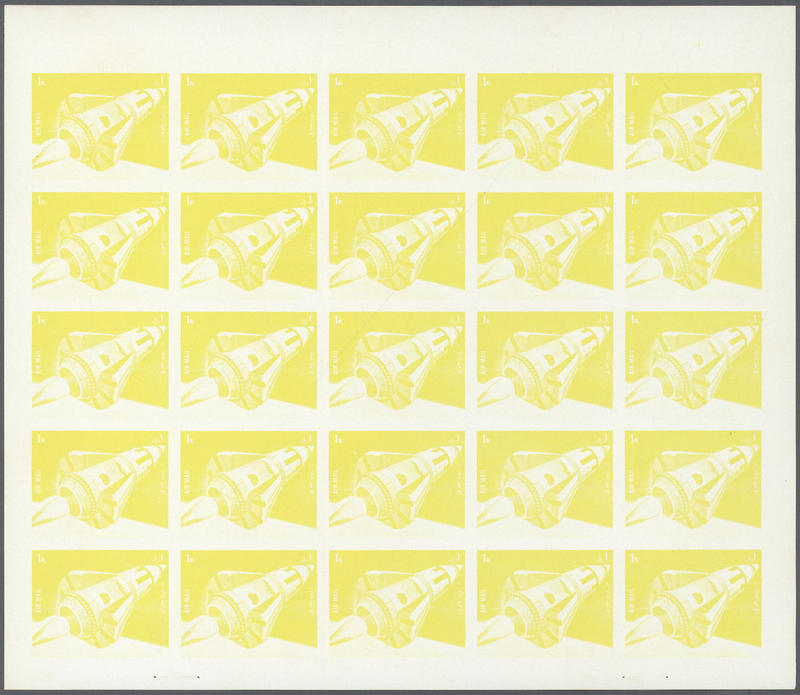 31517 postfrisch (never hinged) ** 1970 (ca. 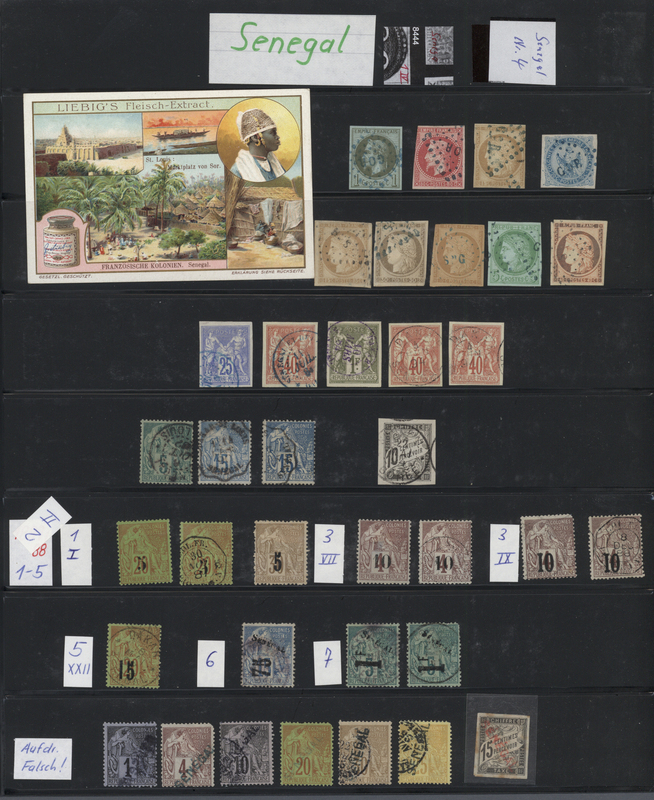 ), Prominent Persons 'NAPOLEON' gold and silver foil stamps investment lot with about 750 stamps incl. silver perf. (180) and imperf. (300) and gold perf. (120) and imperf. 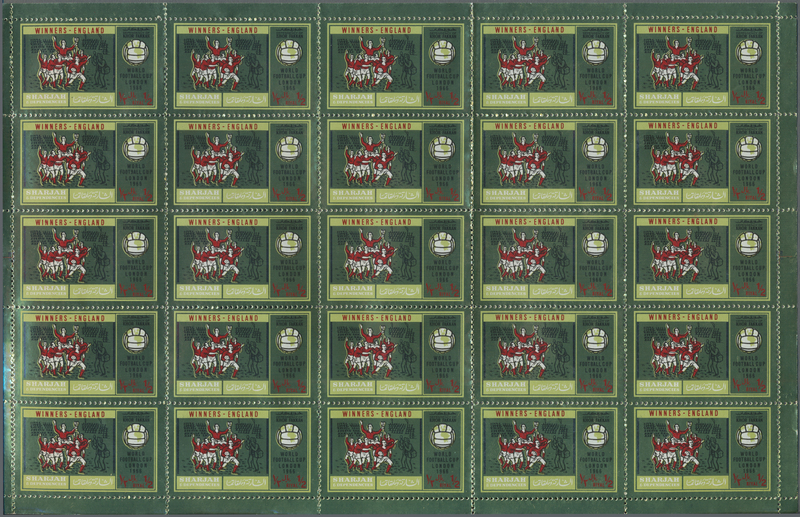 (150), mint never hinged, unusual and very scarce, UNLISTED in Michel cat.! 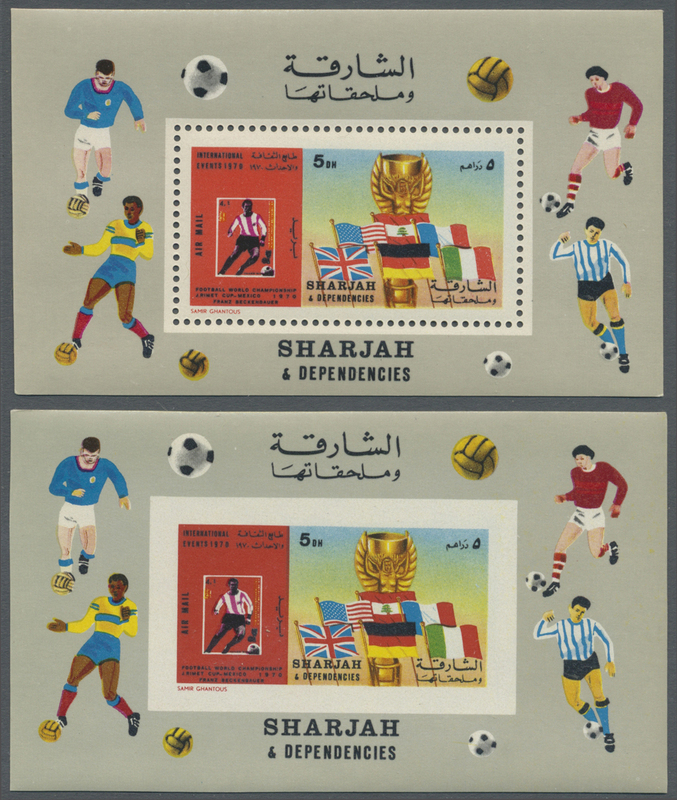 31520 postfrisch (never hinged) ** 1970, Football World Championships large lot with 395 miniature sheets with different issues incl. 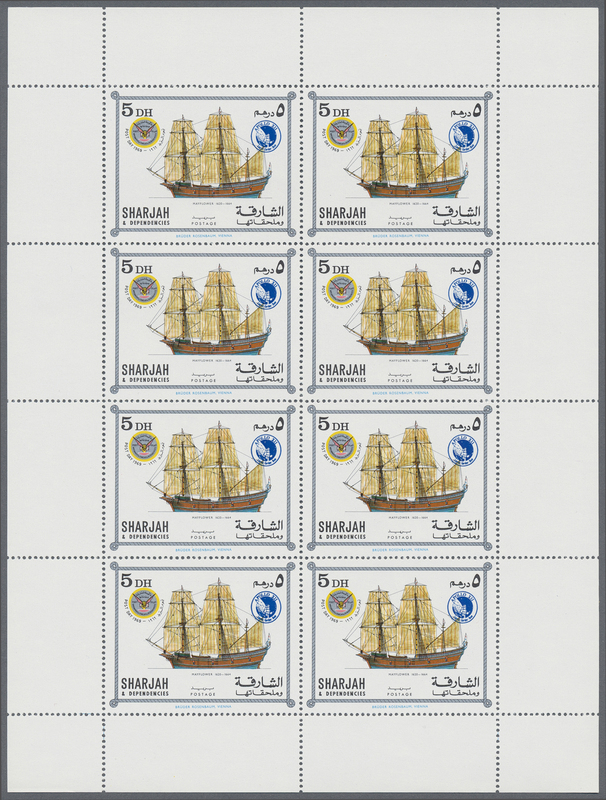 5dh. perf. 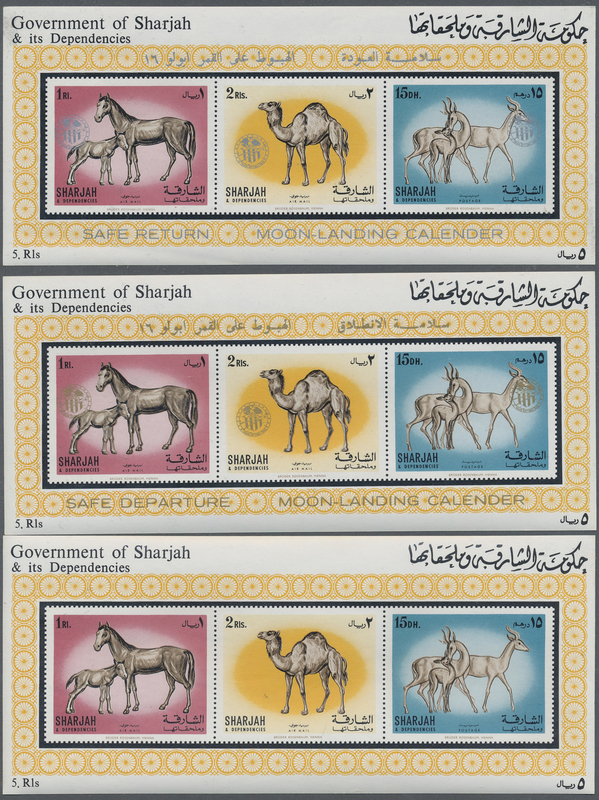 with brown background (85), grey background (65), 5dh. imperf. 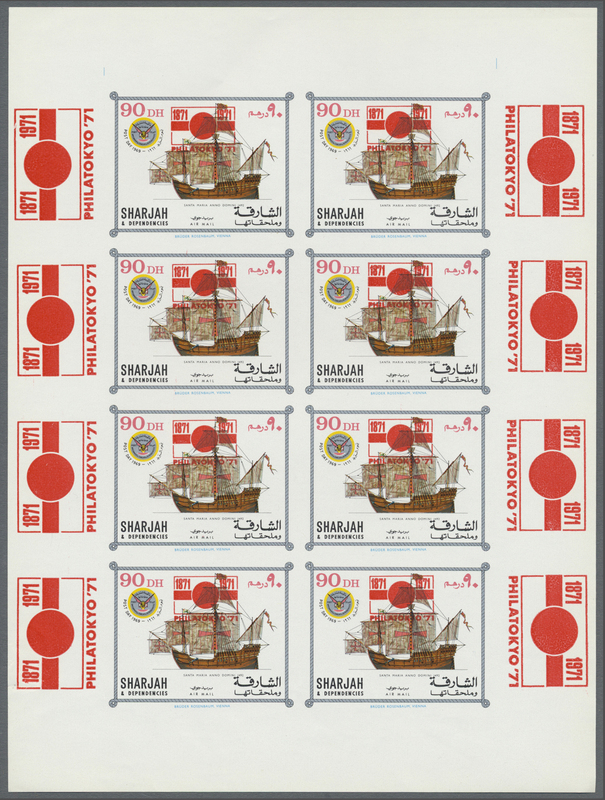 with grey background (200), 4r. with green background perf. (20) and imperf. 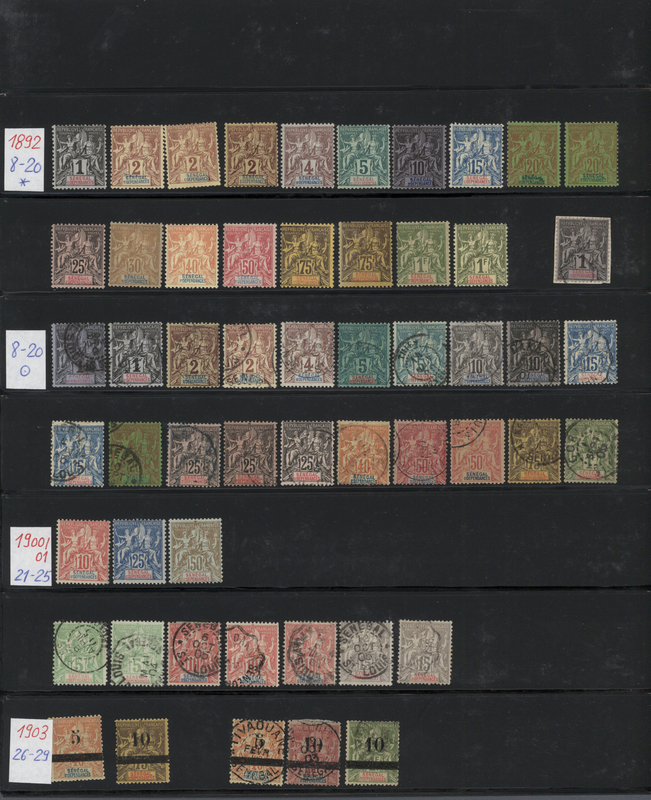 (25), mint never hinged, unusual and scarce offer, Mi. Bl. 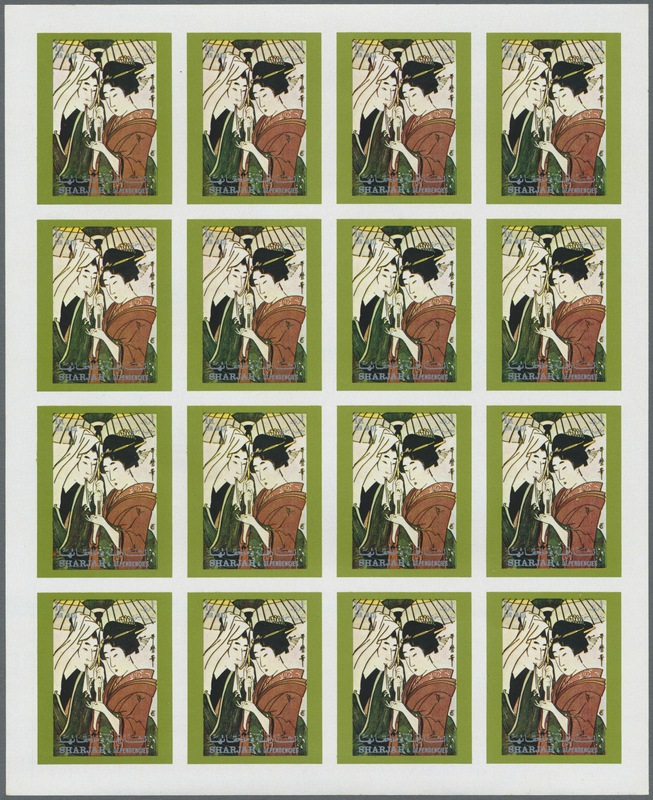 A 65 A+B, 66 A+B, mostly UNPRICED in Michel! 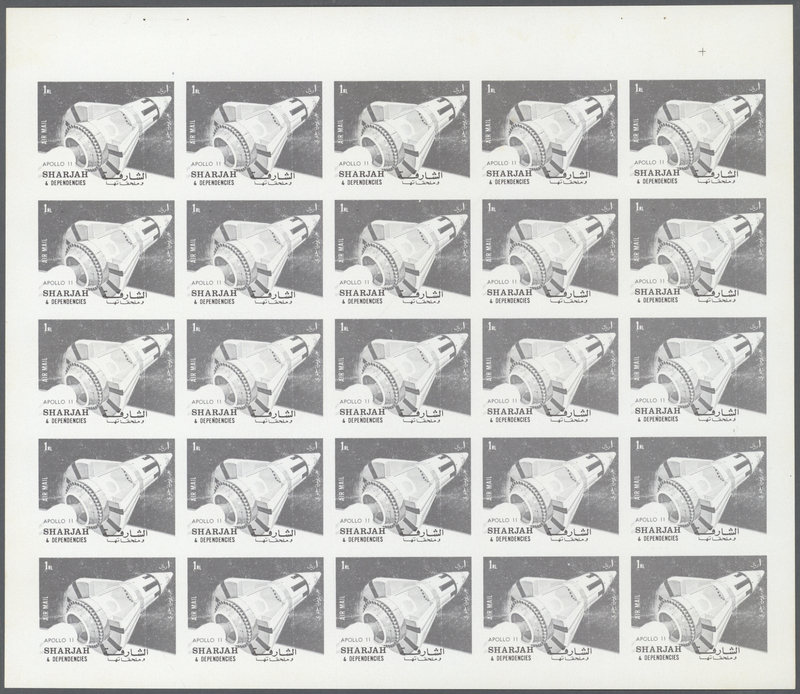 31524 postfrisch (never hinged) ** 1971, Winter Olympics 1972 gold and silver foil stamps investment lot with about 550 stamps incl. silver perf. (at least 100) and imperf. (ca. 195) and gold perf. (168) and imperf. (93), mint never hinged, Mi. 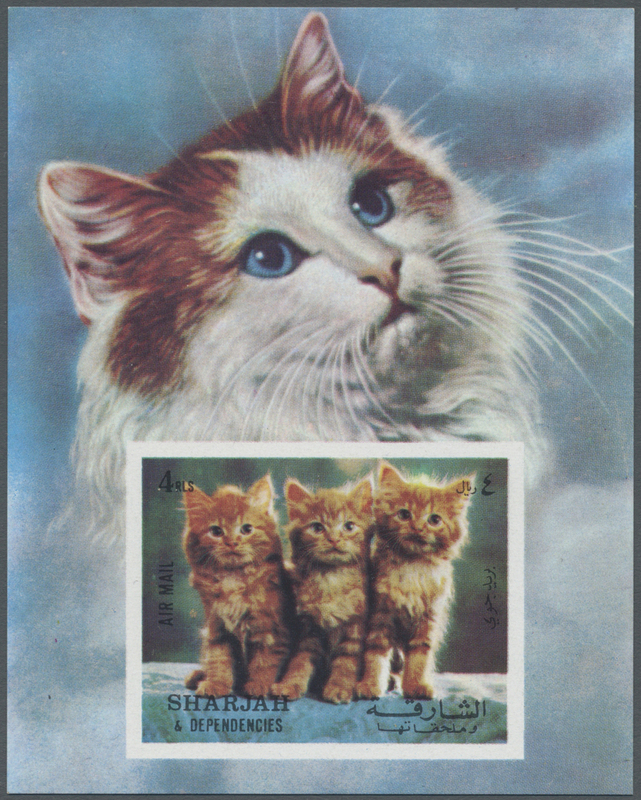 837/838 A/B, cat. at least 11640,-- €. 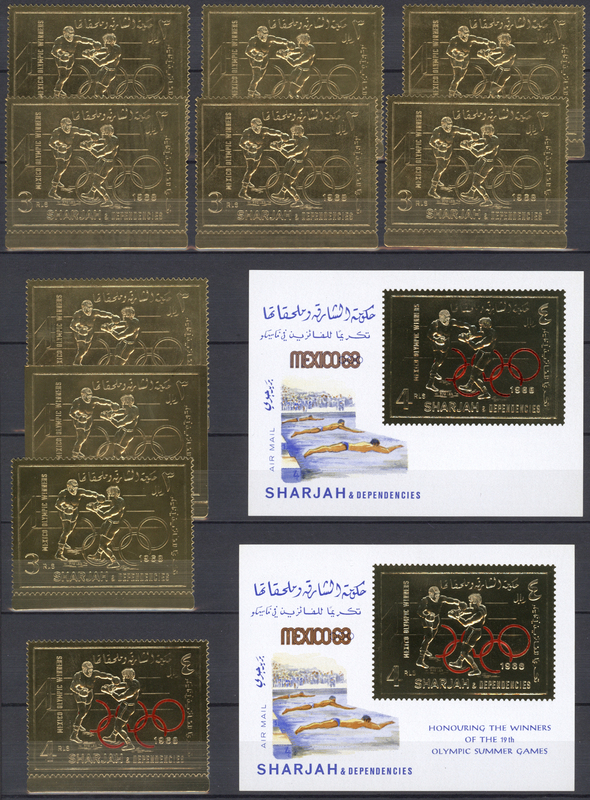 31525 postfrisch (never hinged) ** 1971/1972, more than 220 gold and silver foil stamps, mostly ex Mi.no. 1055/1066 (space) perf. and imperf. mint never hinged. Very high catalogue value. 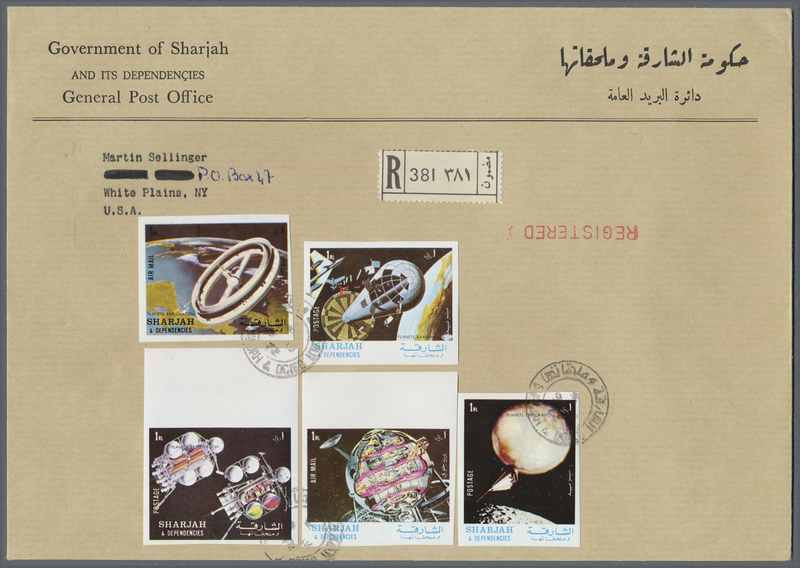 31528 Brief (cover) 1972, SPACE, group of 19 covers addressed to USA, bearing atractive thematic frankings incl. 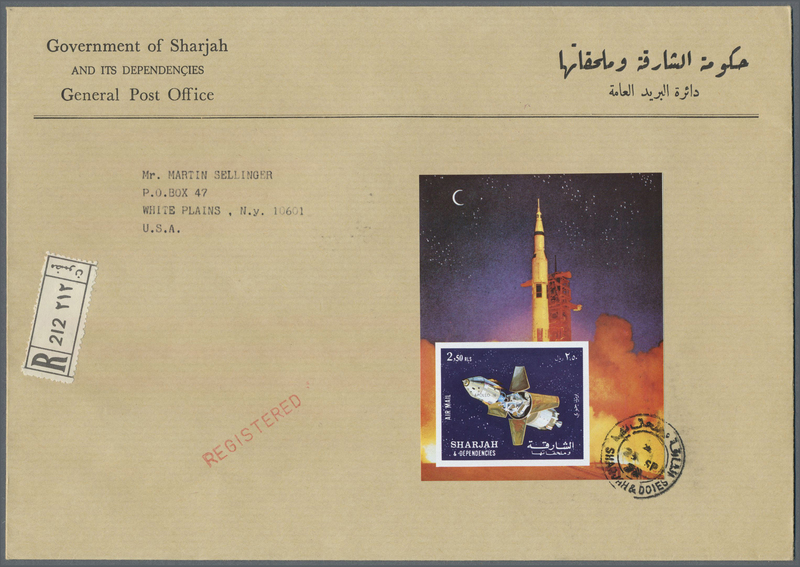 imperfs and souvenir sheets, thereof 14 registered mail with arrival mark. Very rare offer! 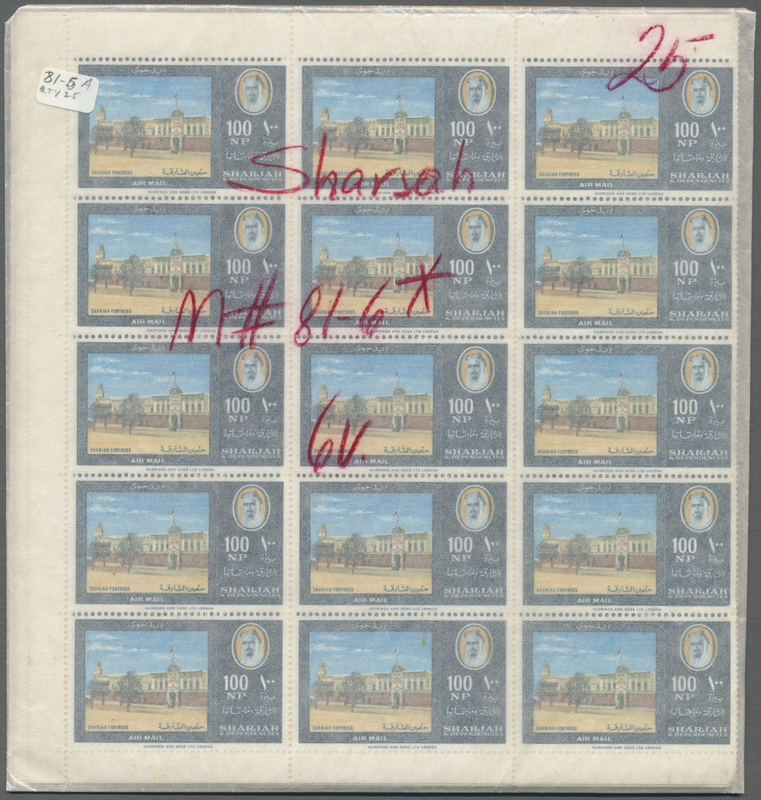 31532 postfrisch (never hinged) ** 974 (25) Proofs 1972. 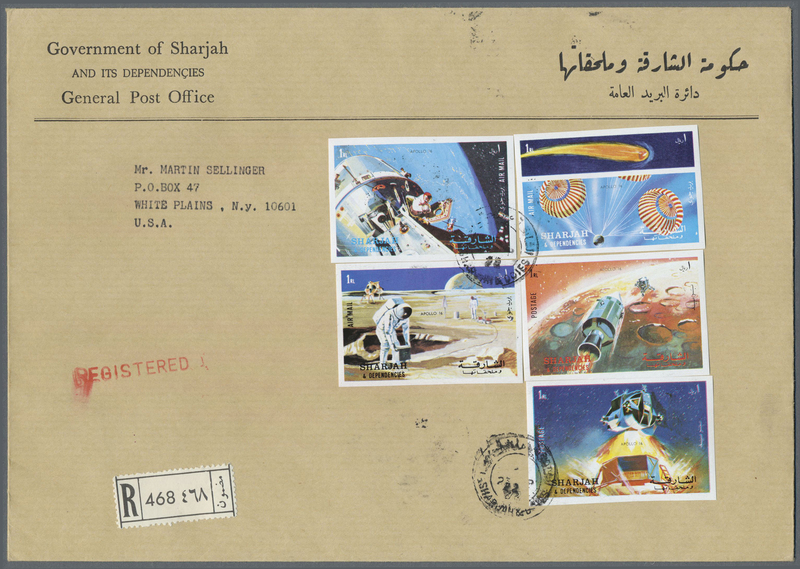 Sharjah. 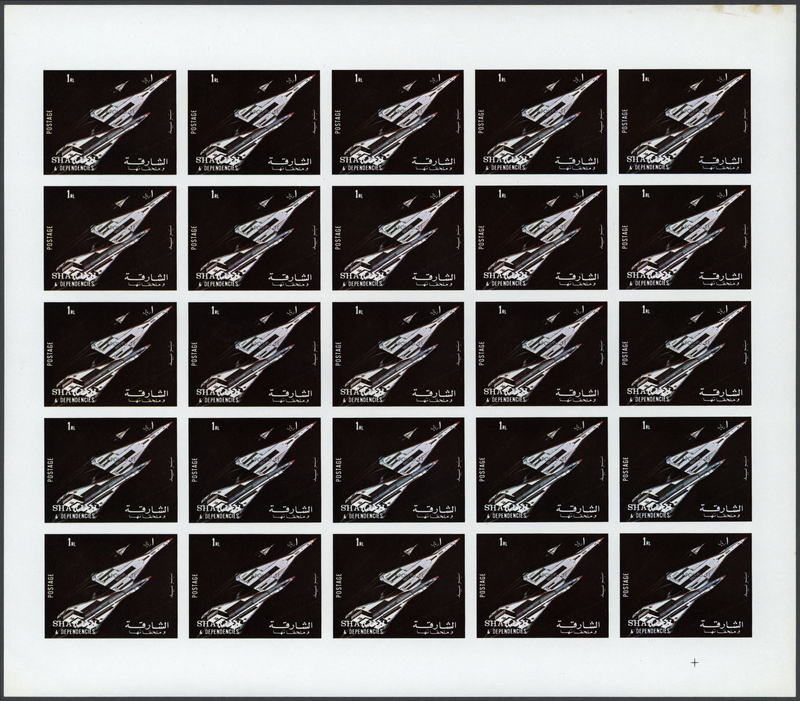 Progressive proof (5 phases) in complete sheets of 25 for the fifth 1r value of the APOLLO 11 series showing "Space Craft". Mint, NH. Tiny pin holes in margin. 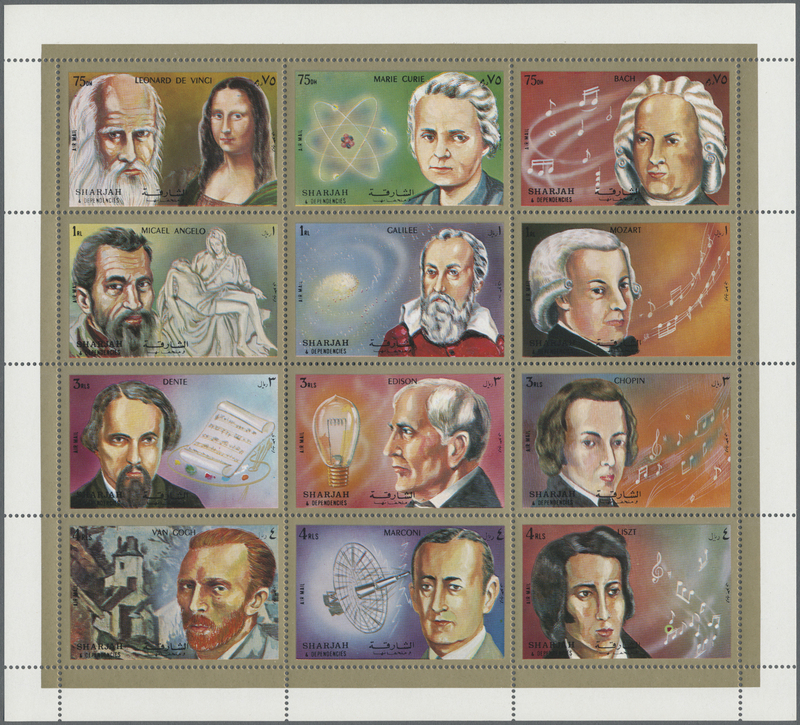 In all 125 proof stamps. 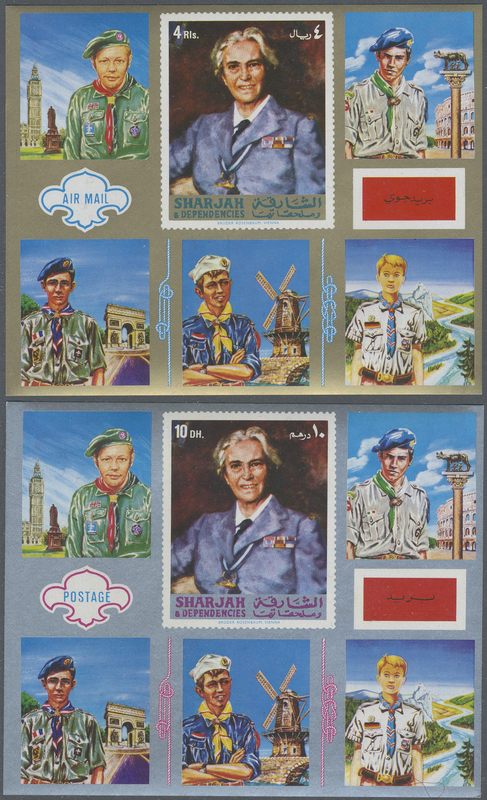 31533 postfrisch (never hinged) ** 988 (25) Proofs 1972. 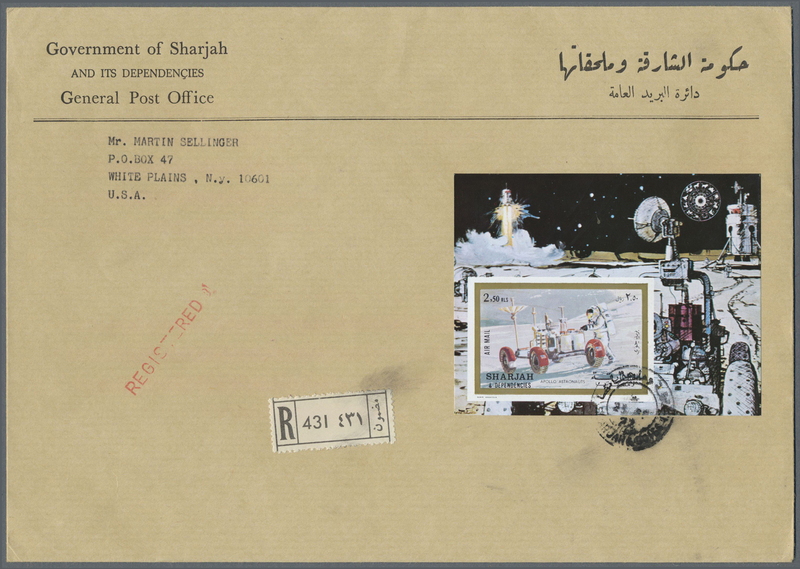 Sharjah. 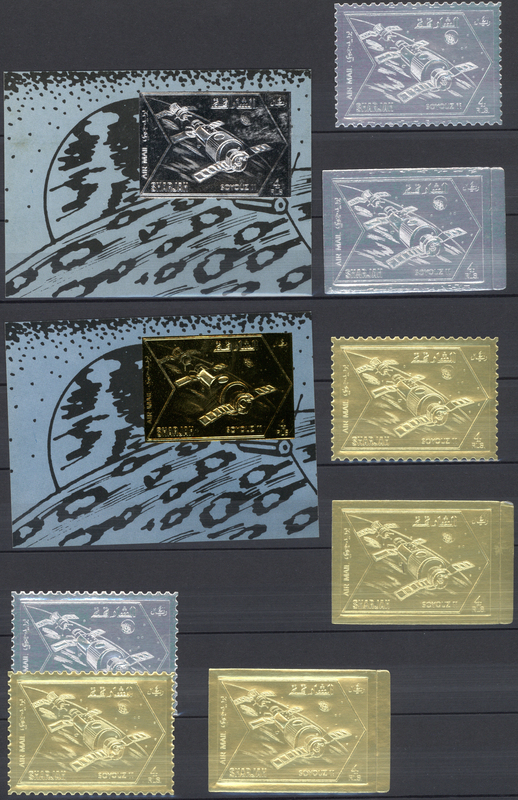 Progressive proof (5 phases) in complete sheets of 25 for the first 1r value of the APOLLO 17 series showing "Command Center of the Space Craft". Mint, NH. Tiny pin holes in margin. 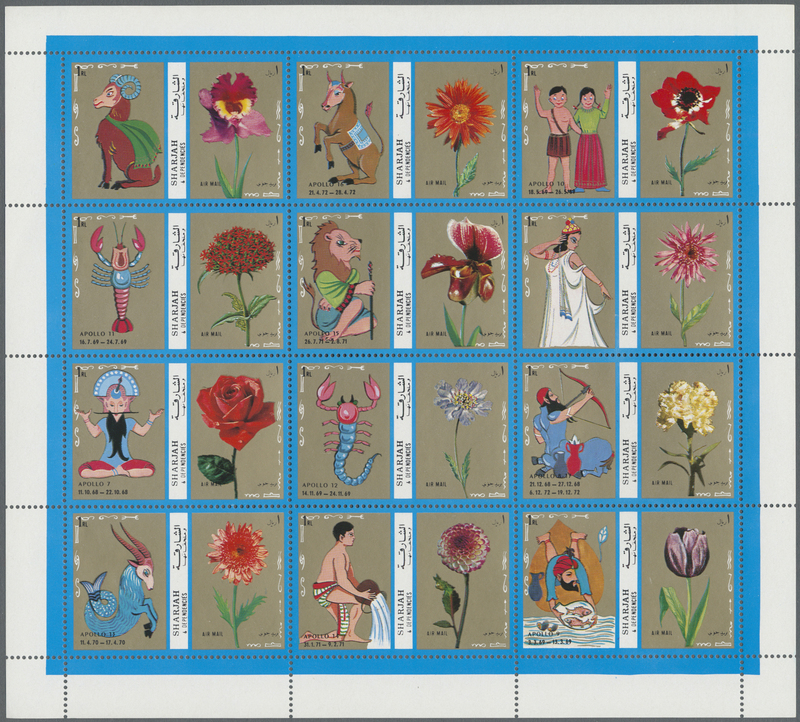 In all 125 proof stamps. 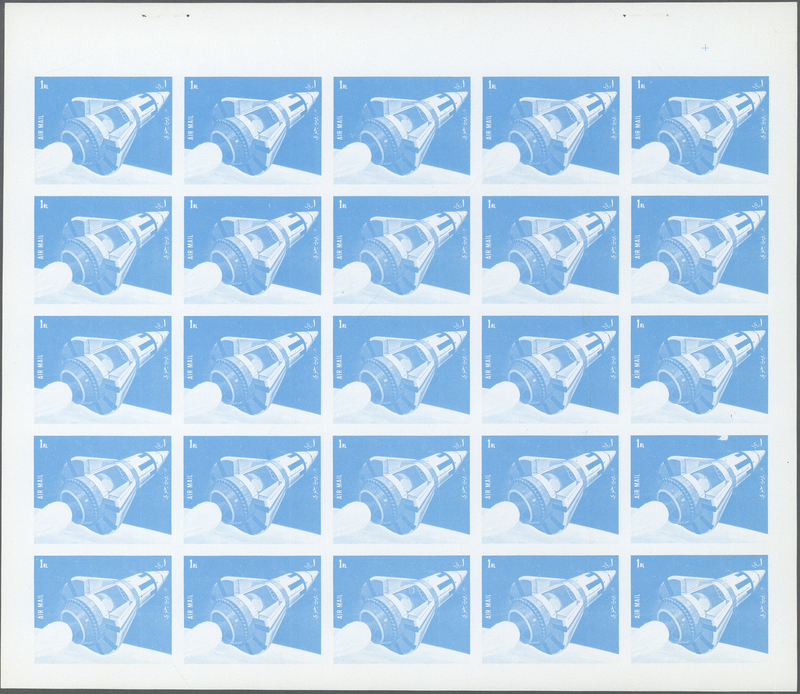 31534 postfrisch (never hinged) ** 1033 (25) Proofs 1972. 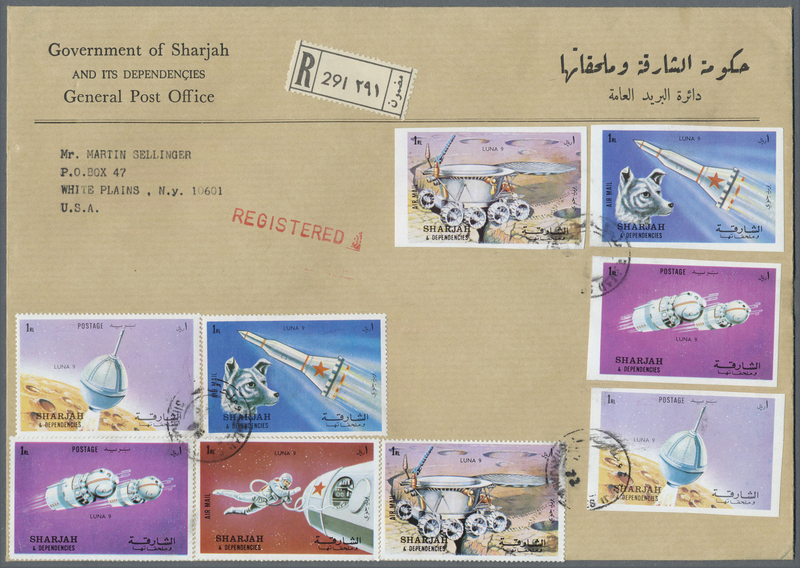 Sharjah. 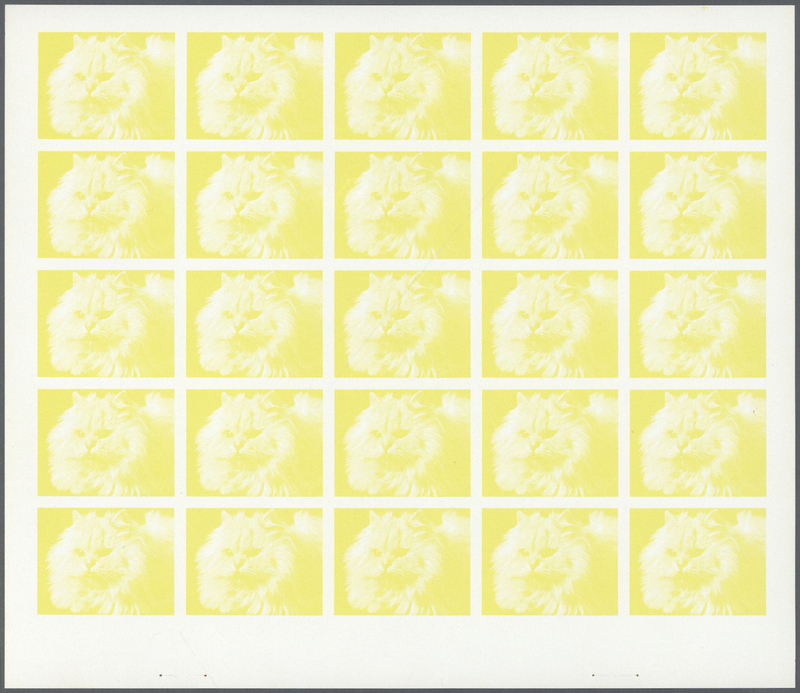 Progressive proof (7 phases) in complete sheets of 25 for the 1r value of the CATS series showing "Yellow Persian Cat". Mint, NH. Tiny pin holes in the wide margin (left or bottom). 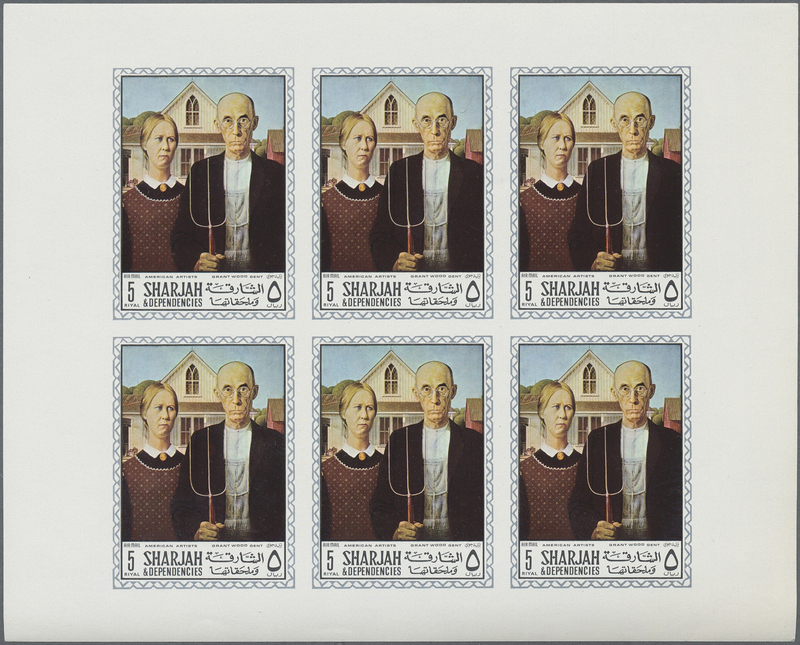 In all 175 proof stamps. 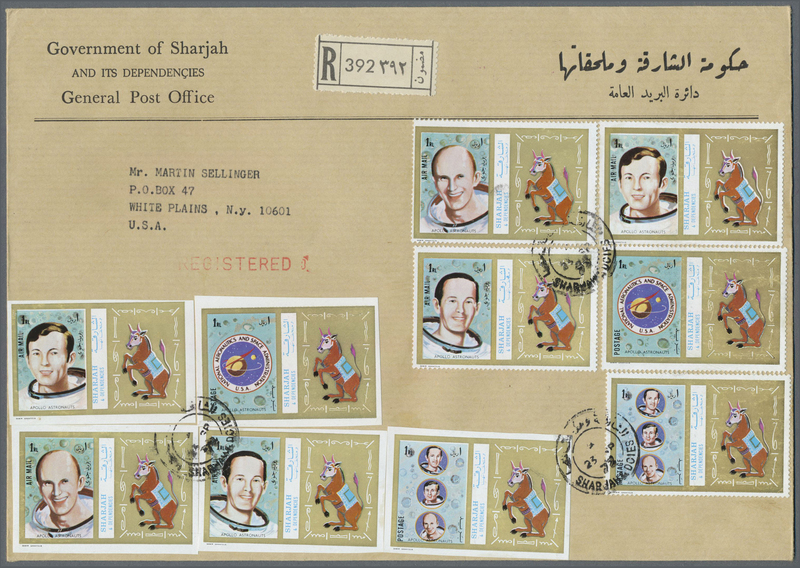 31535 postfrisch (never hinged) ** 1039 (25) Proofs 1972. 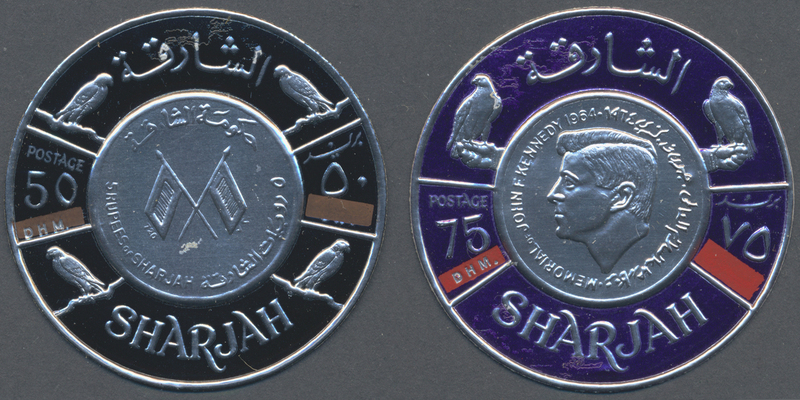 Sharjah. 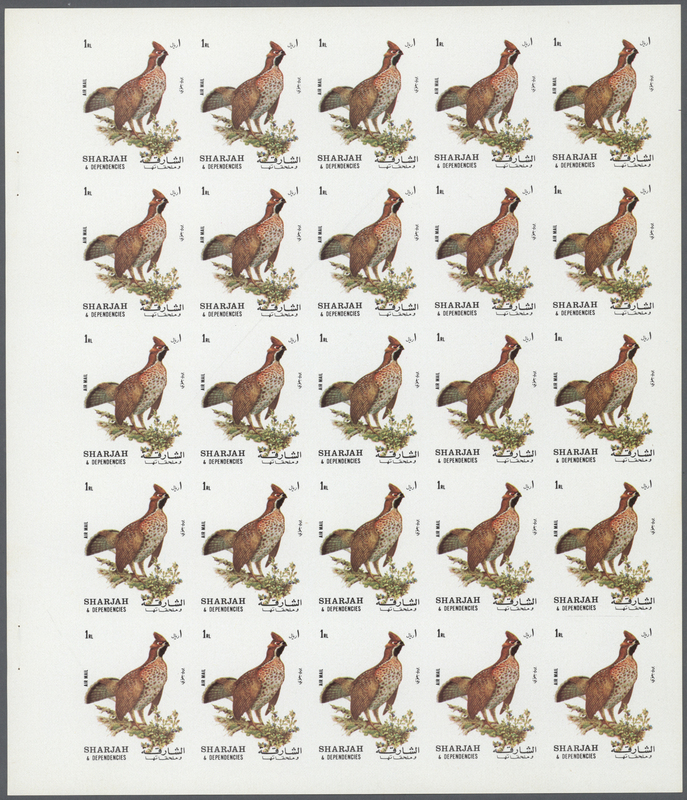 Progressive proof (7 phases) in complete sheets of 25 for the 1r value of the BIRDS series showing "Tetrastes bonasia". Mint, NH. Tiny pin holes in the wide left margin. 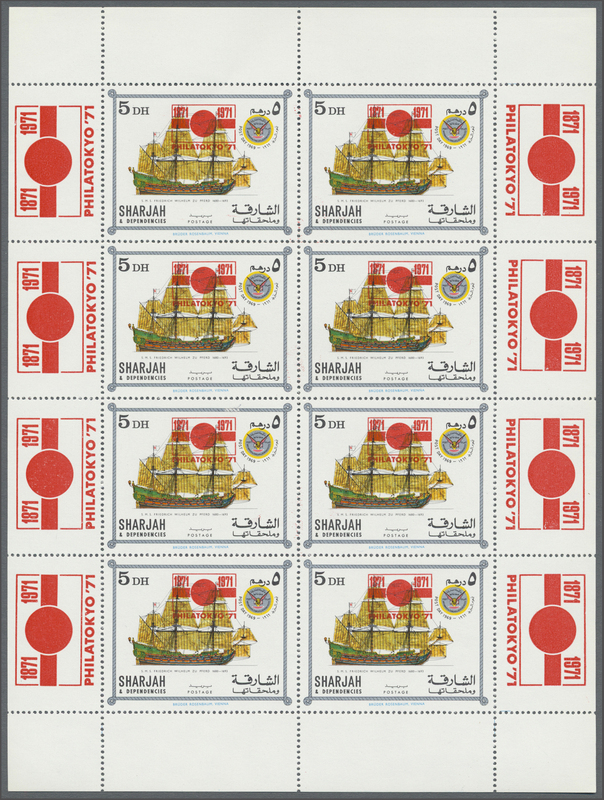 In all 175 proof stamps.